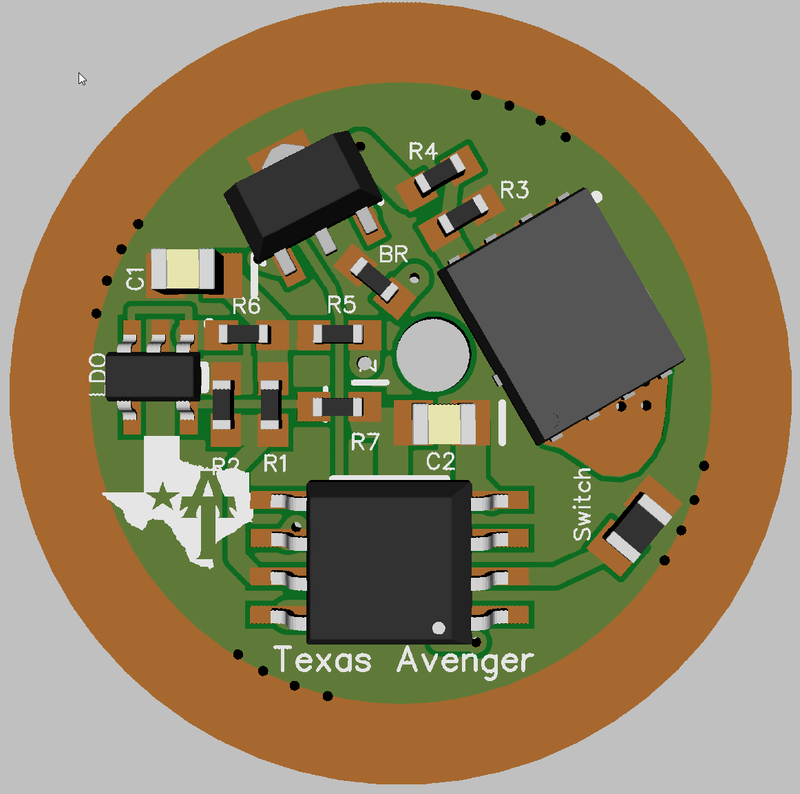 Texas Avenger "TA" Driver series - Triple channel + Bistro or Narsil + Clicky or E-switch - The Ultimate open source driver! 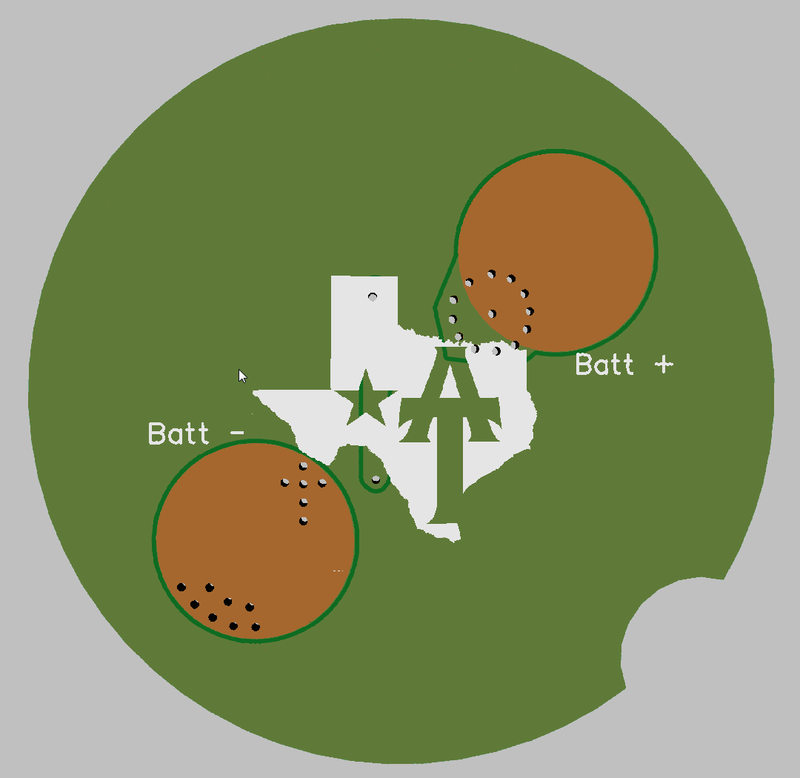 Let me introduce you to the Texas Avenger AKA the “TA” driver series. Now in sizes ranging from 15mm up to 46mm and lots in between! Same design, firmware and parts for (almost) all of them! Great project to put together and learn about electronics. And for size comparison, it is easy to forget the size of these things. This project is open source and you are welcome to use this work yourself for personal projects. However you must release any and all changes, variations and updates to this project completely open source. Posting them in this thread is the best way to do this. If you want to use these drivers in a commercial application please contact me for costs and terms. You must get my personal permission to produce these drivers for commercial purposes. 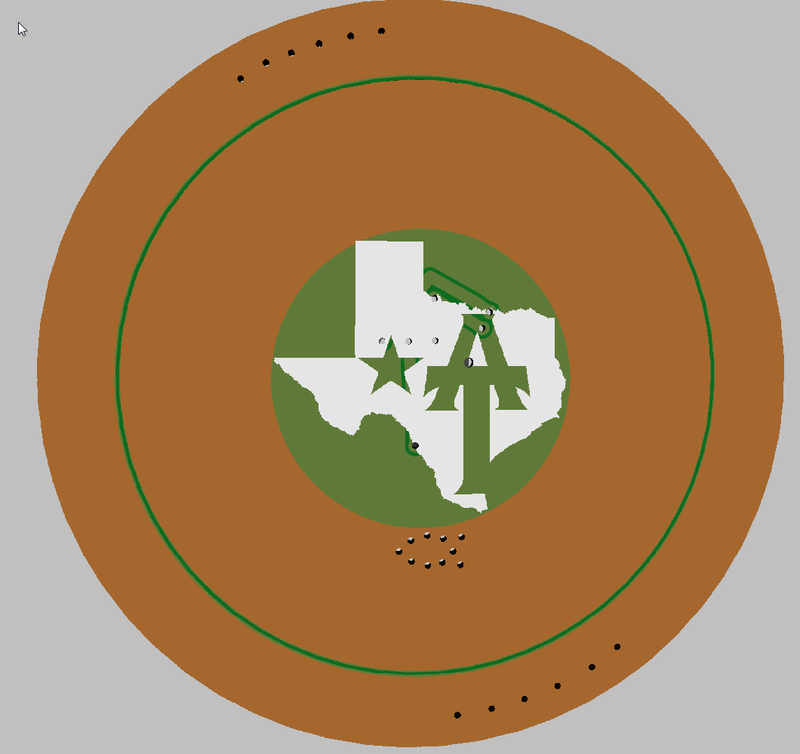 No one else may use or sell these designs or the TA / Texas Avenger brand without my permission. I am the sole owner of these. 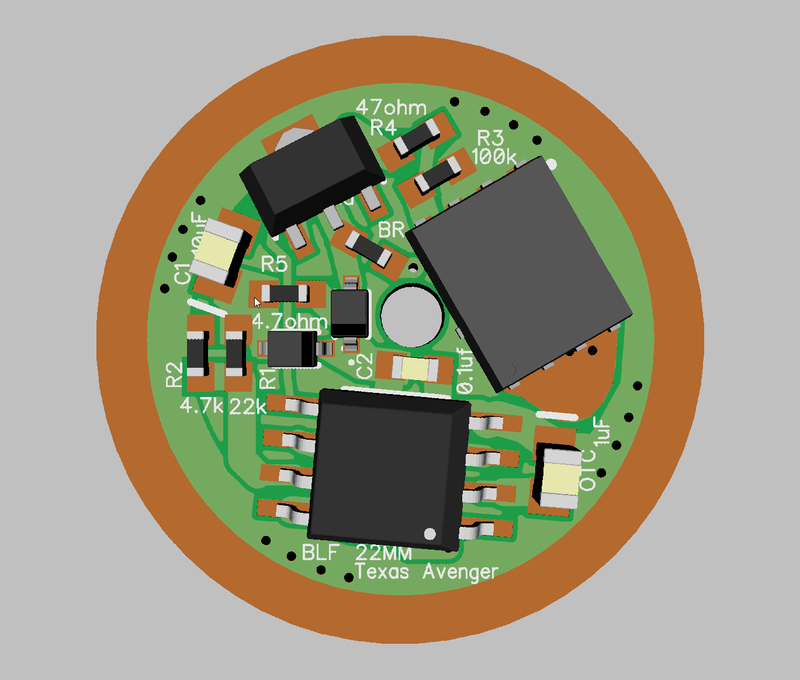 Ok, the idea with these drivers is that you can order them from OSHpark and keep them on hand for any build you may desire. The real key feature is the 3 channels combined with Bistro and Narsil to give you nearly endless options when it comes to UI. I find that the single 7135 is a great regulated low mode, even for high powered triples. Also a must for truly low moon modes. The FET is obviously for turbo and works great at getting the most lumens possible. The bank of 6-8 7135’s is where things change from your normal FET+1 setup. This bank allows for a great non-PWM, regulated high mode on most lights and you can simply leave some 7135’s off to adjust it to your exact liking. Or if you need the space leave them all off and you can then clear any retaining ring you may desire. - 3 fully PWM channels, 1 to a LFPAK56 FET, 1 to a single 7135 on the top of the board and the last goes to a bank of 7135’s on the bottom of the board. - Large LED+ wire pass through, suitable for 20-18 gauge silicone wire, even larger if teflon coated wire. 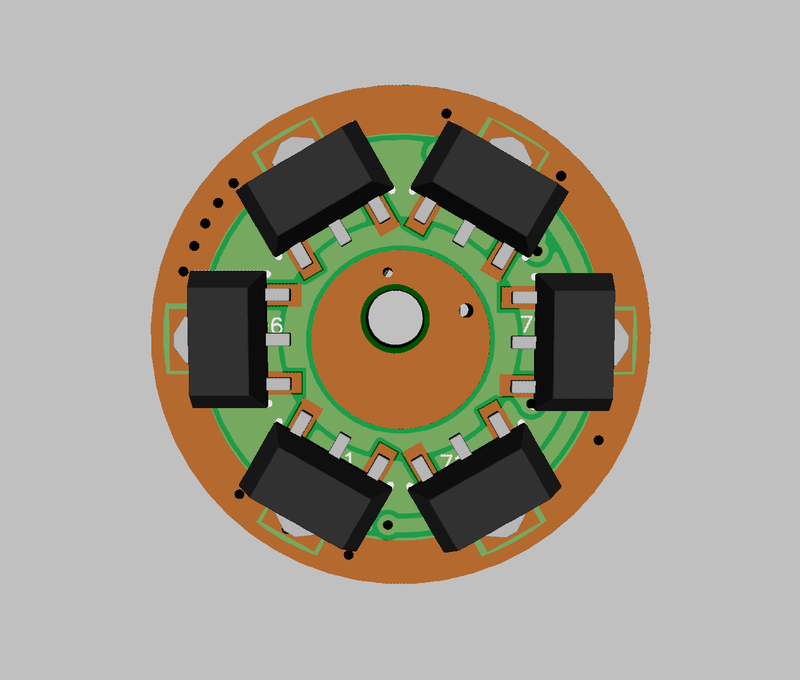 So now to the Drivers themselves, they are designed around the parts list from DEL. U2 : LFPAK56 MOSFET (aka, “FET”). PSMN3R0-30YLDX is a popular cheap option, the SIR800DP is better but costs more. The resisters are all 0603 package (but you can use 0805 if you desire, just have to be more careful when building the driver). Diode and Zener are both SOD-323 package. The C1 cap is 0805 in all cases. C2 is 0603 in all cases (0805 could be used). 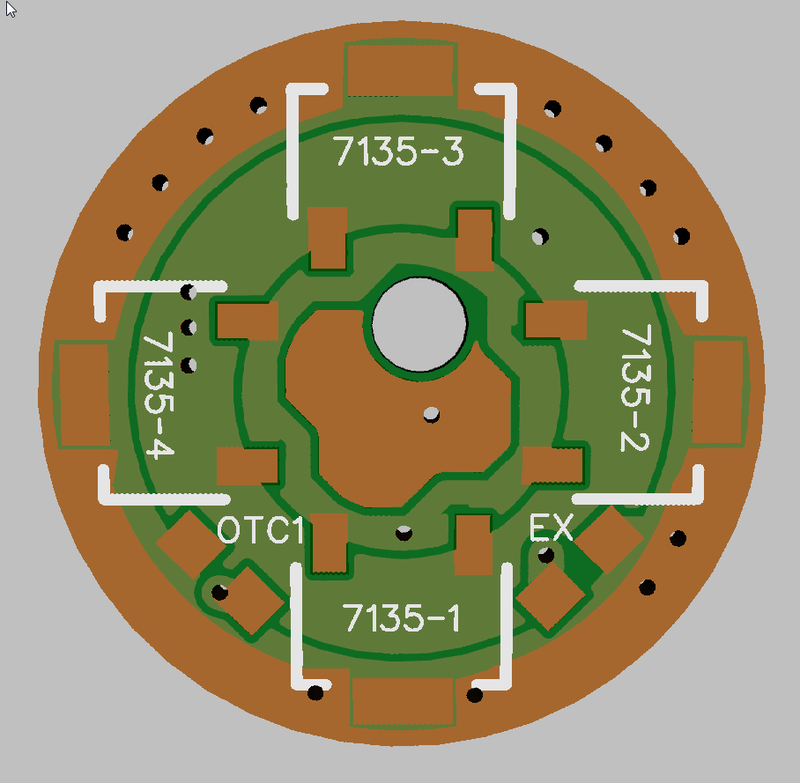 The OTC is 0603 in the 17mm version and 0805 in the others, this is to make e-switch conversions easier. 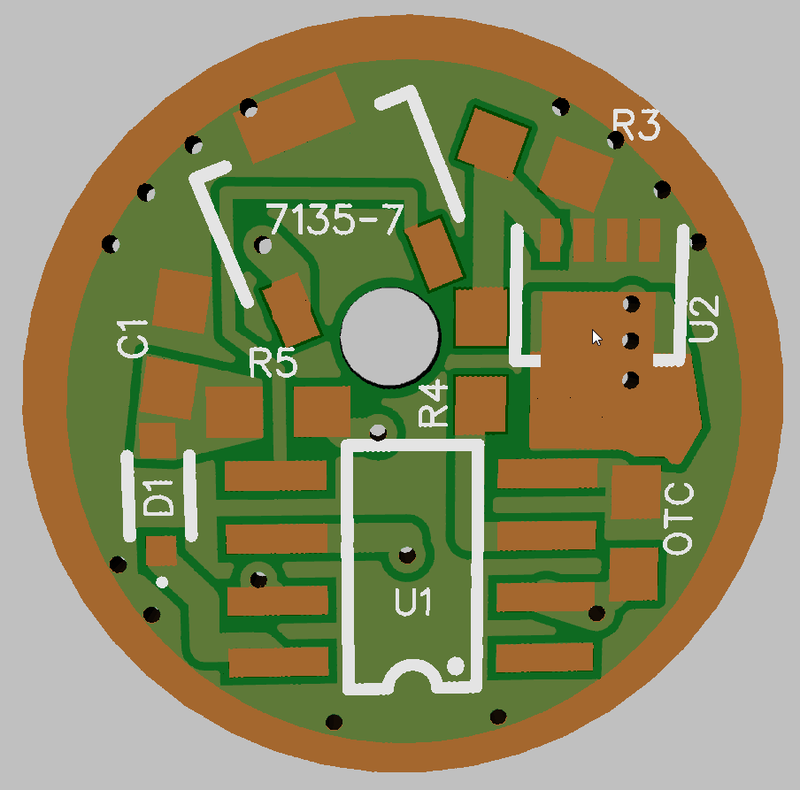 You can fit 0805 on the 0603 pads if you are careful but if ordering new components, might as well go with 0603. 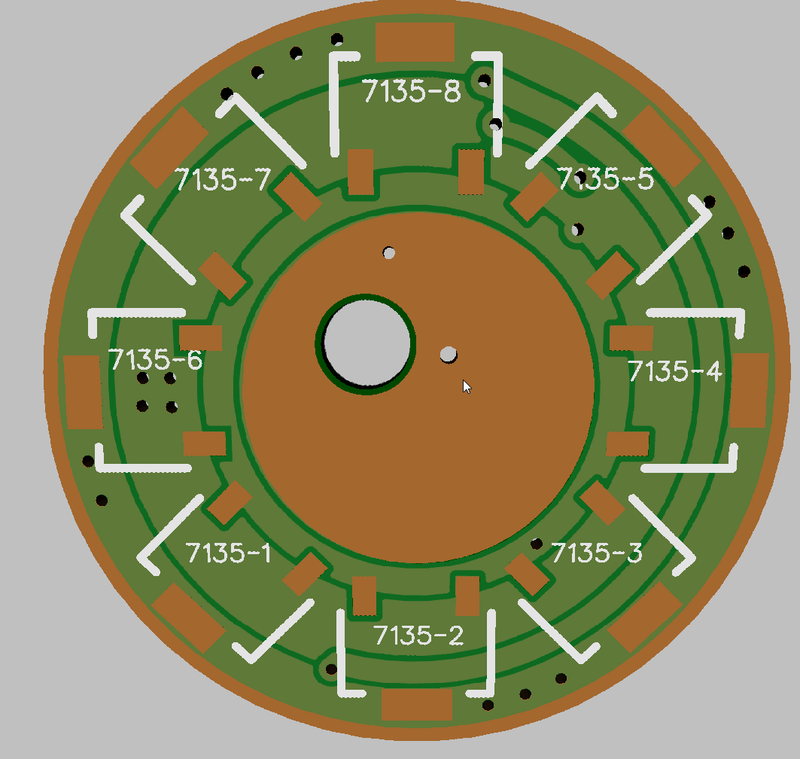 The same can be done in reverse, you can put 0603 on the 0805 pads. Here is a DigiKey shopping cart with the components I used, there are both better and also cheaper options available if you want to pick out your own, so this is just for reference I like getting a bit tighter tolerance OTC as it can help when things get hot for example). The items with a quantity of 1 have multiple options that you will need to pick from in the cart. These are the FET’s and MCU. The SIR404 is the better FET but costs over twice the price, the NXP works just fine for most things. 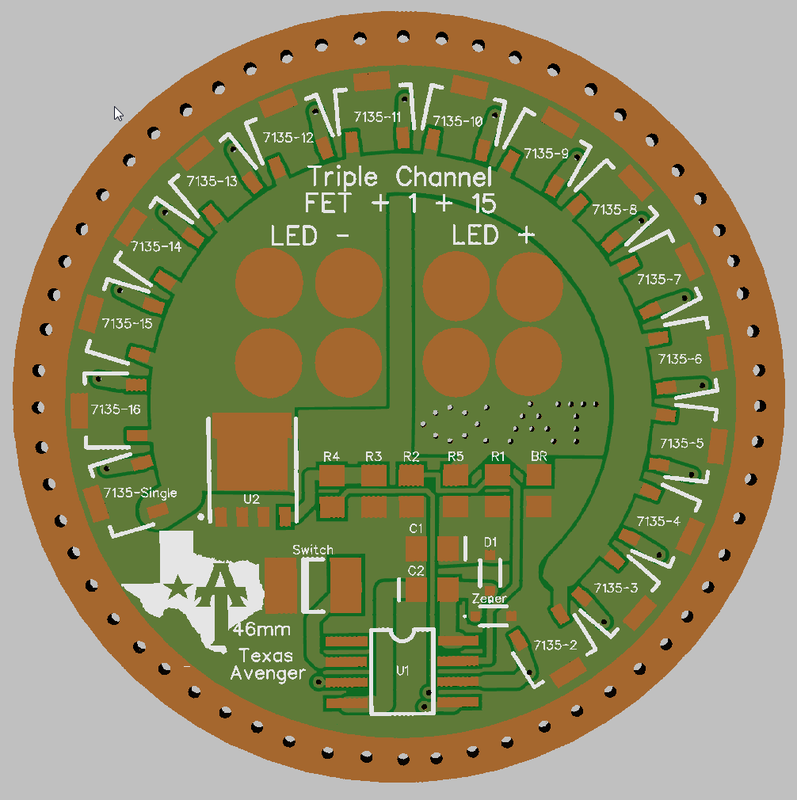 The other are the Attiny version that you want. 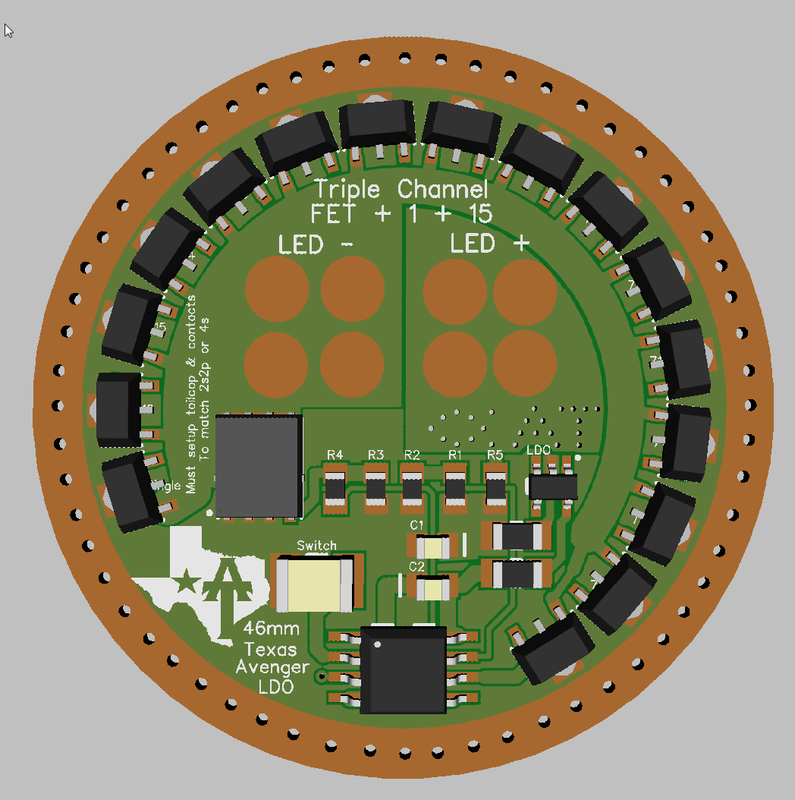 As it stands right now you need the Attiny25 for Bistro and the Attiny85 for Narsil (aka, e-switch). 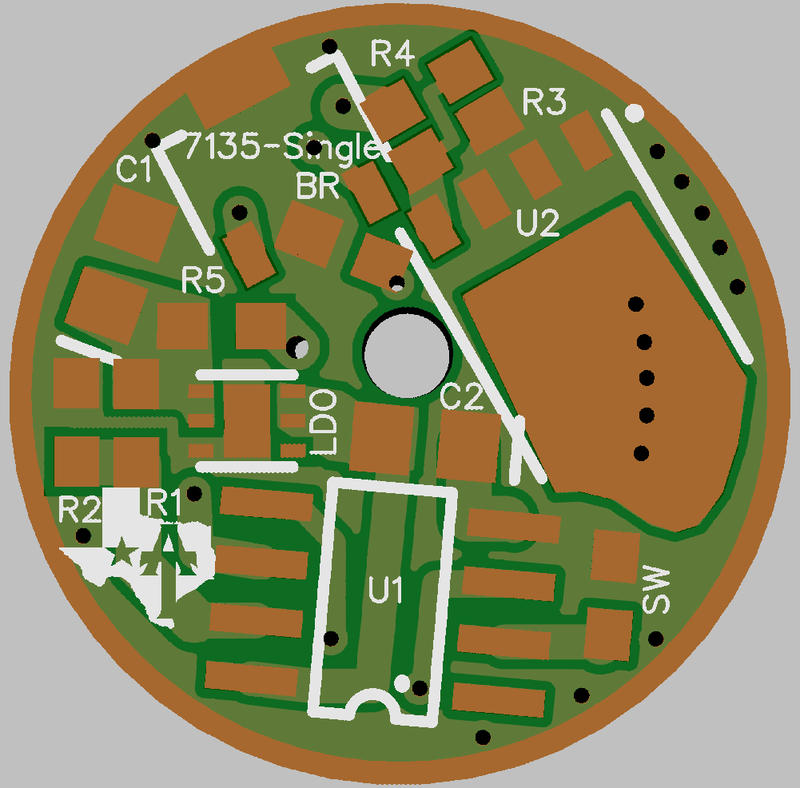 You can also get the MCU/FET from RMM as well for a bit less money. Also note that the cart includes both 0805 and 0603 OTC caps, you can remove one if you desire. The 7135’s are not included in this shopping cart as I don’t think digikey sells them, they are best ordered from links above. Here are the firmware options for the TA drivers! Here is the official release of the Bistro Texas Avenger edition. I have everything I could cram into the available space in here. If TK ever has time to compact things a bit more then I plan to extend it with 31 mode groups and some more blinking modes along with a few other things but they will not really effect 98% of people. 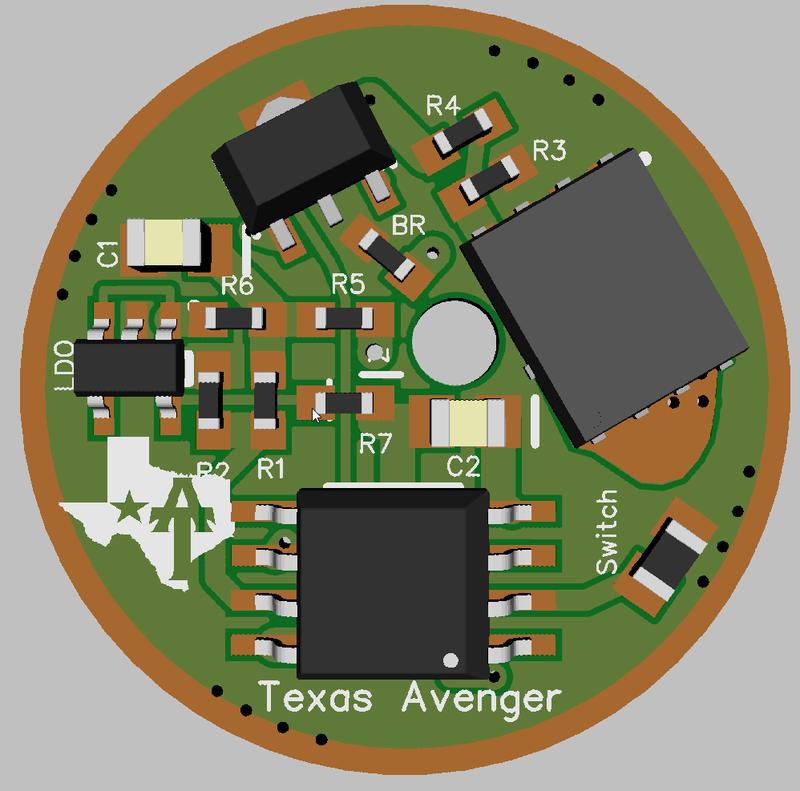 This firmware will work on any of the Texas Avenger drivers when used with a clicky switch. For e-switch lights we have the amazing Narsil by TomE to take care of us. So a quick rundown for the TA version of bistro. You can adjust the mode order and moon mode separately to further increase the options to 96 different combinations of modes! A few other minor changes that won’t really matter. Basically this firmware is setup so that 98% of people can simply flash it as is and tweak it in the menu to get exactly what they want out of it without ever having to touch a line of code! Flashing the firmware is quite easy to do with less then $5 worth of parts and a computer. There are threads on this if you search with way more info then I could give. Flashing a pre-made hex file is quite simple though even for novices. 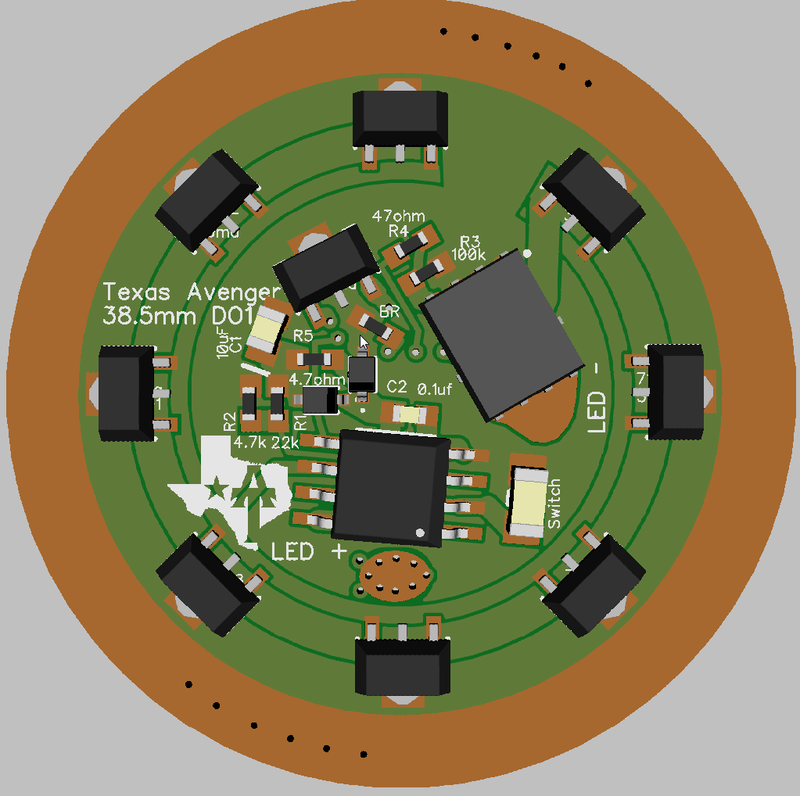 It works exactly like normal bistro, the only changes have been to the modes and mode groups to work best with the Texas Avenger drivers. 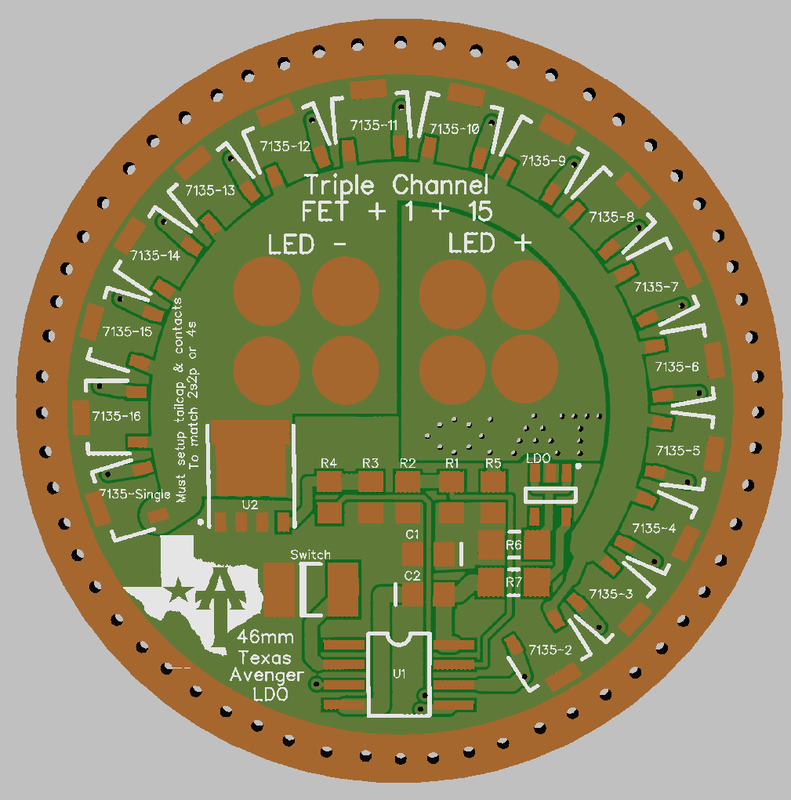 Above this you are using the FET and it will vary wildly depending on the build. Now here are the mode groups as seen in the code, using the above lists it should not be too hard to figure out what numbers will deliver which current/brightness. It includes everything you need to either compile your own version with all the needed extra files already in place, or use the per-compiled version and simply flash it with AVRdude. It includes a batch file to make that much easier as well. It also includes some useful python scripts by TK for calibrating things along with the voltage, OTC and temperature calibration firmware for those that really want to dig into things. Oh, I have the Narsil-triple posted on my google drive share. 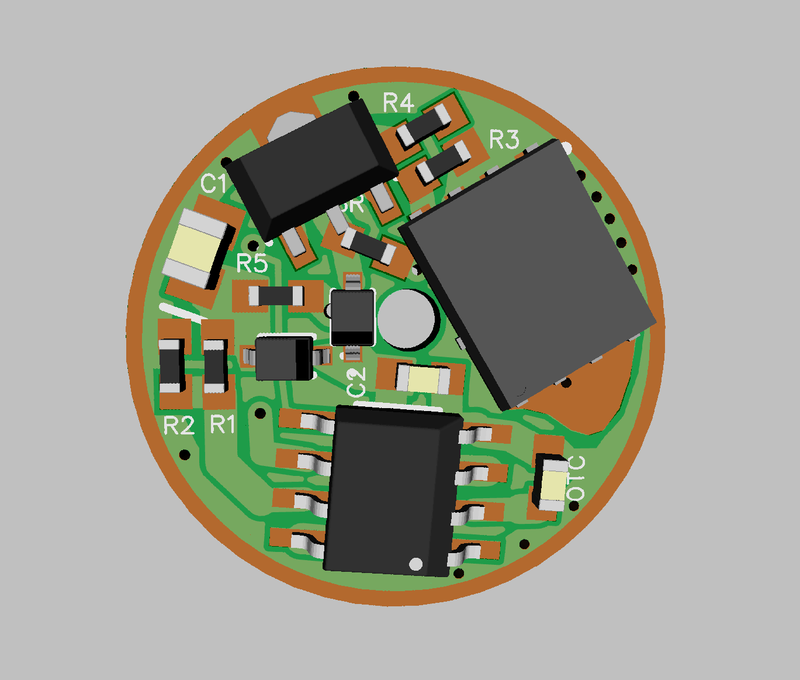 Still the latest, but I’ll need to be working on the 15 mm support, so need to get the LEd working on pin #7, and the battery monitoring working off od the internal reference. Also in the same folder is the latest v1.1 manual for Narsil – it still applies for v1.2. It’s in both Word doc and PDF formats. The latest firmware to be released for the TA series is Bistro-HD by Flintrock. It uses the FAR superior OTSM (Off Time Sleep Mode) method of long clicks instead of the old OTC (off time capacitor) method. This means that long clicks are always exactly the same length regardless of how hot the light is. There are also many other improvements and adjustments as well. Bistro HD does require a different parts list and other changes to the driver setup, so make sure you read and understand how to use HD before doing it. Here is the main HD thread with the full manual on using HD, it is highly recommended that you read this before attempting to build an HD driver! The spec for OTSM also requires V version (10Mhz, low voltage version) chips. You might get by without it, but it won’t work as well and may cause corruption. These are the ideal R1 and R2 resistor values for multi-cell setups. Many more details can be found in the HD thread. When using a multi-cell setup you need to move the D1 diode to the R7 resistor pad with the anode (the white line) pointing away from C2. For most setups you will simple go to the HEX sub-folder and select the firmware that fits your needs. They are named pretty good so if you read the names you should be able to figure out which version it is that you need. Then simply flash it like you would any other firmware. The code is also included for those that want to dig deeper. There are other links to firmware in the main HD thread as well. They could be newer then the TK repository or older, it is hard to say, check both places in the future. 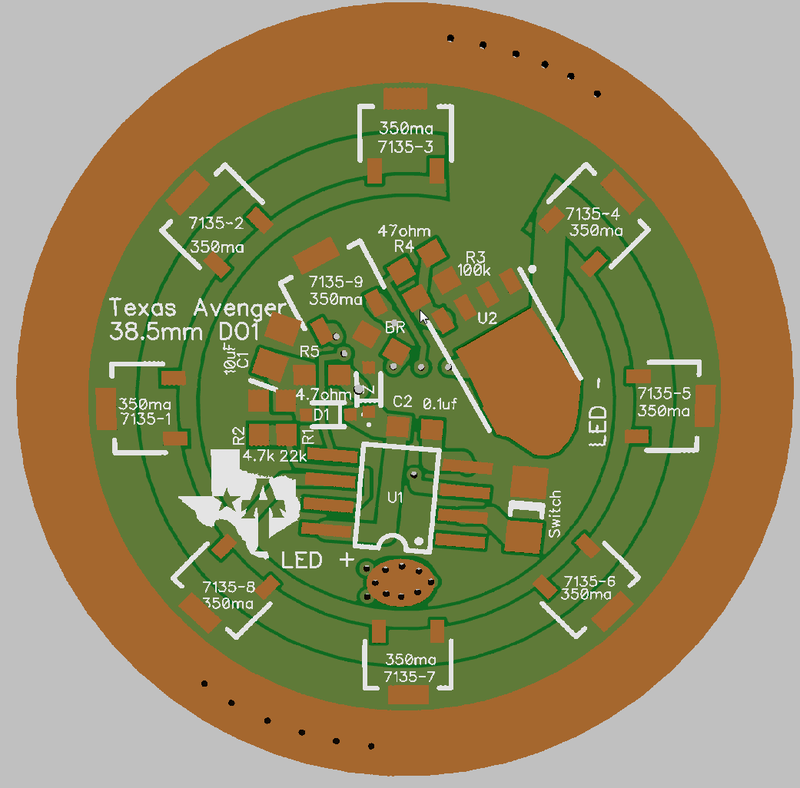 Now that we are don’t with the firmware it is time to move onto the PCB’s themselves! 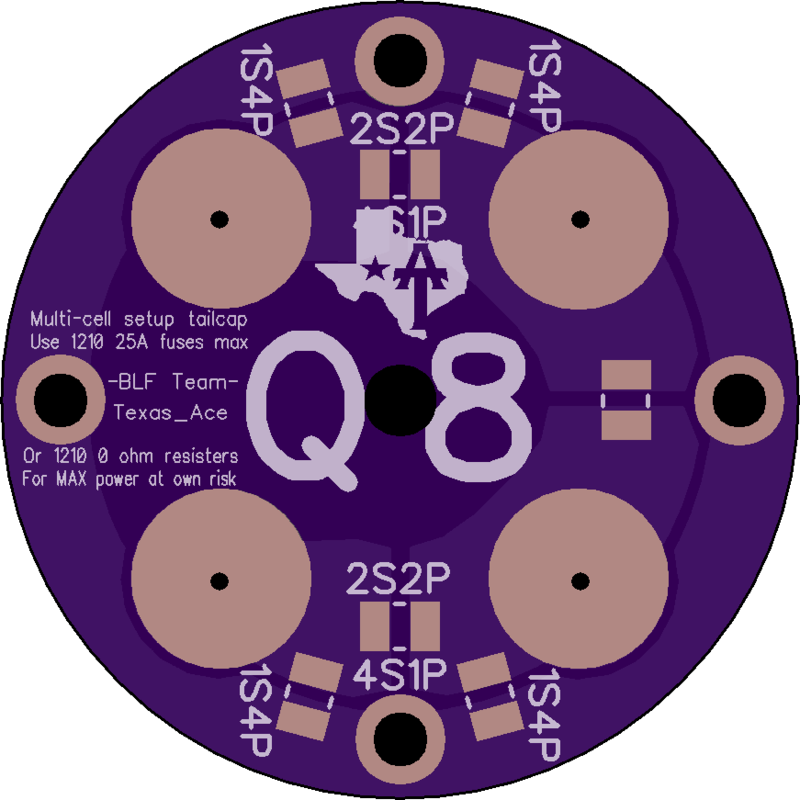 The downloads from OSHpark includes the source files for diptrace for anyone that wants to play around with it, along with pictures of the drivers assembled from diptrace to make assembly easier and a schematic for each one. 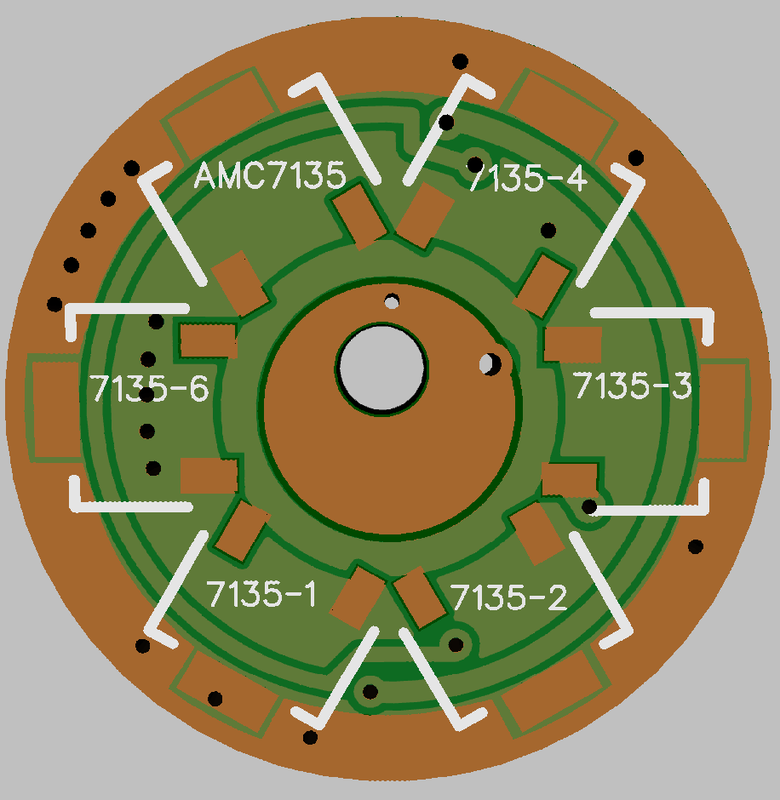 Here is the schematic that is used for all of them (save for the number of 7135’s of course). 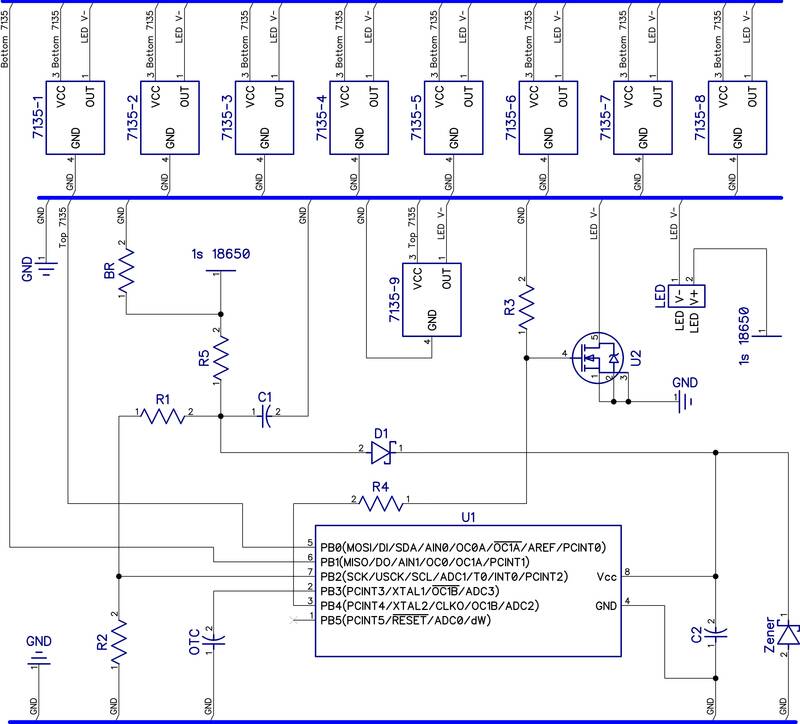 The great thing about Diptrace is that once you have the schematic the rest is easy. You just have to figure out how to fit it on the board. 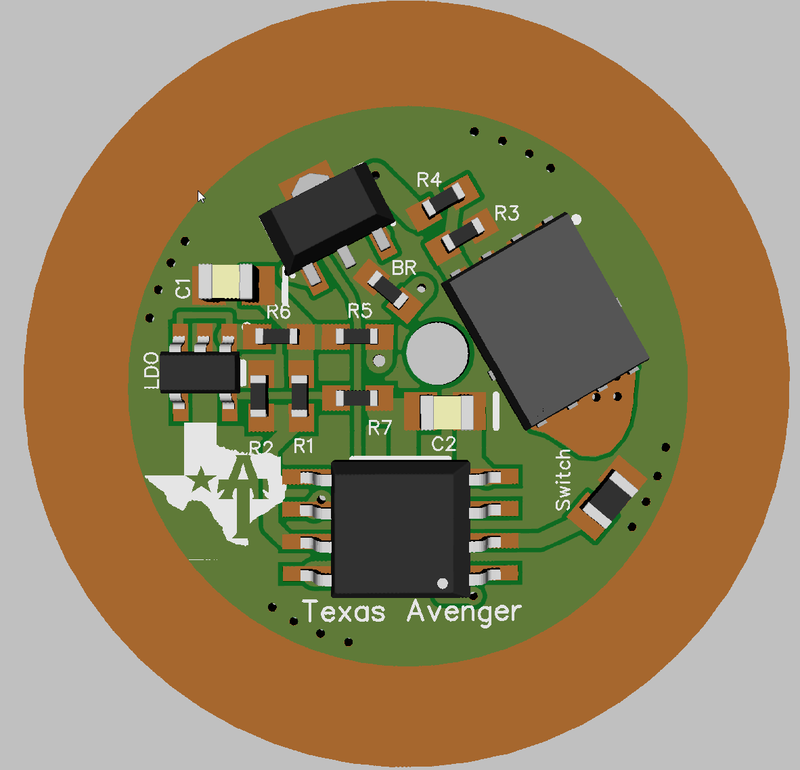 First up the TA17 – 17mm series : the actual circuit is the same for all of the Texas Avenger Series, just a bit more compact on the 17-19mm versions. These use the 17mm driver as a base with the edges extended to the desired size. 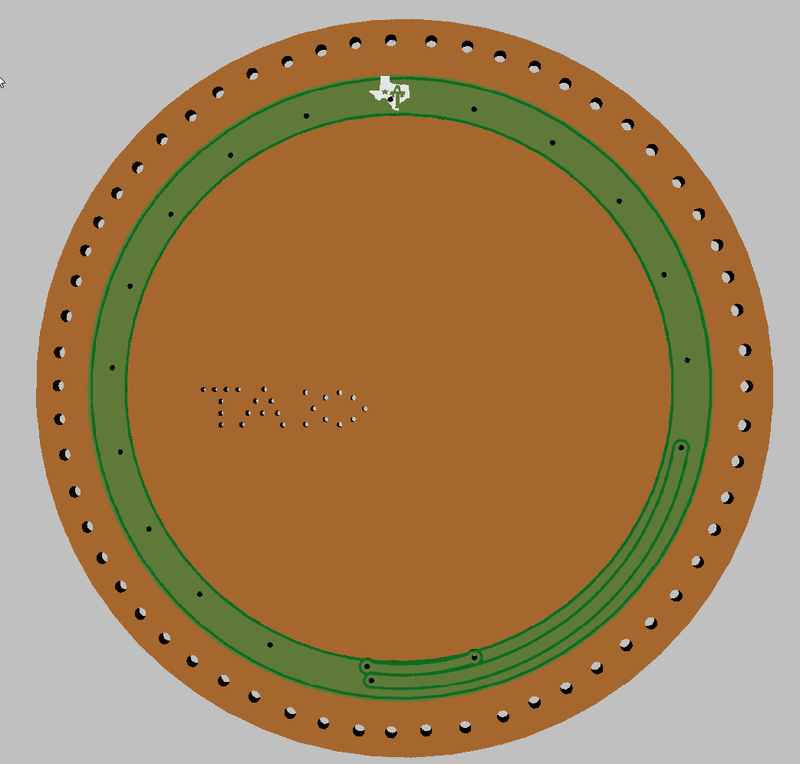 Here is the TA20 – 20mm series : Same as above these are all the same exact parts layout, just with different diameters. 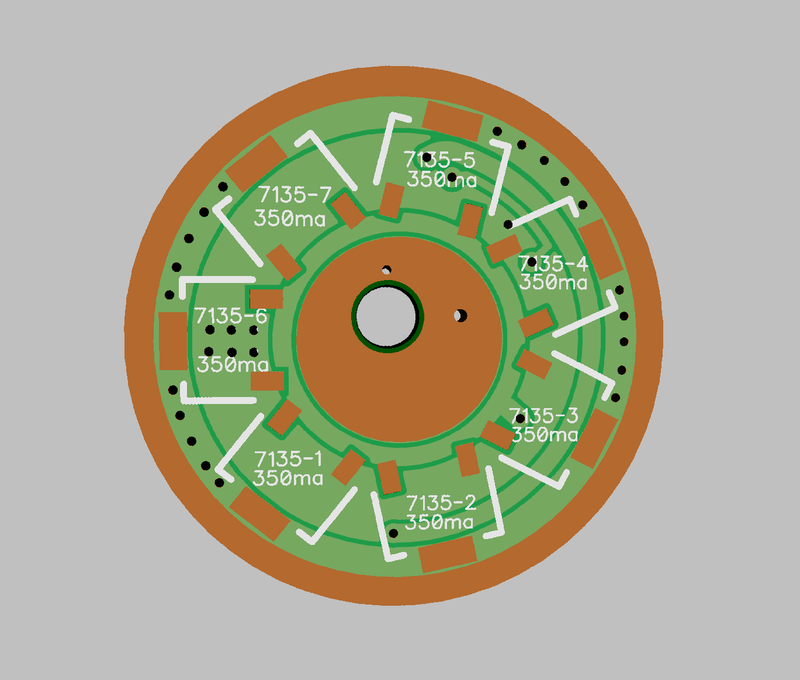 This version has the parts slightly more spread out then the 17mm series and adds an extra 7135 on the back for 8 total. Also changes the OTC capacitor from 0603 to 0805. 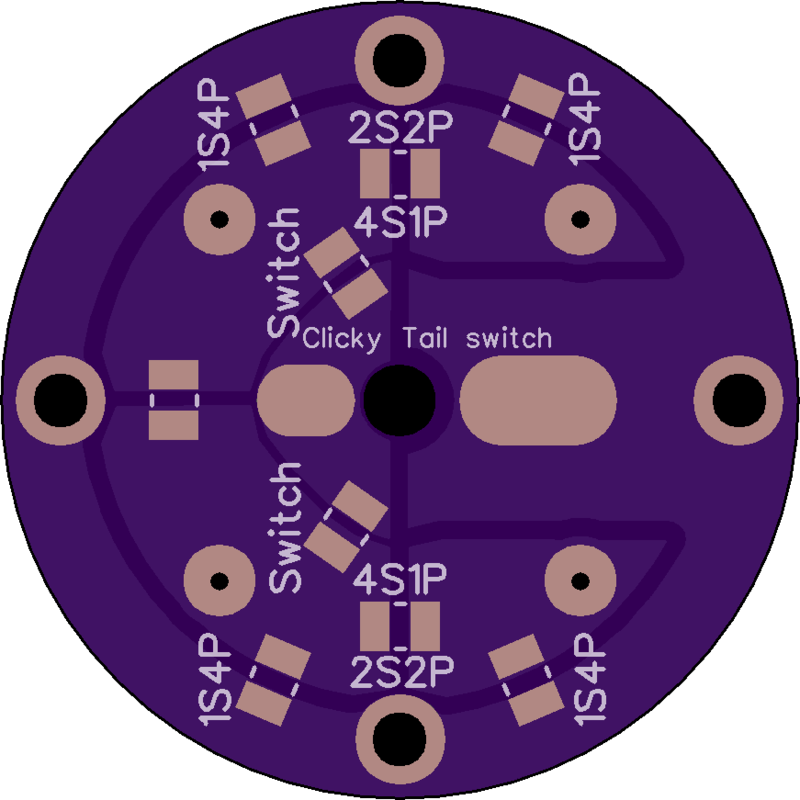 TA22 – 22mm series : adds another 7135 to the backside, I figure 9 is enough for basically anything, over that the FET will get you taken care of. Slightly more roomy layout yet again. 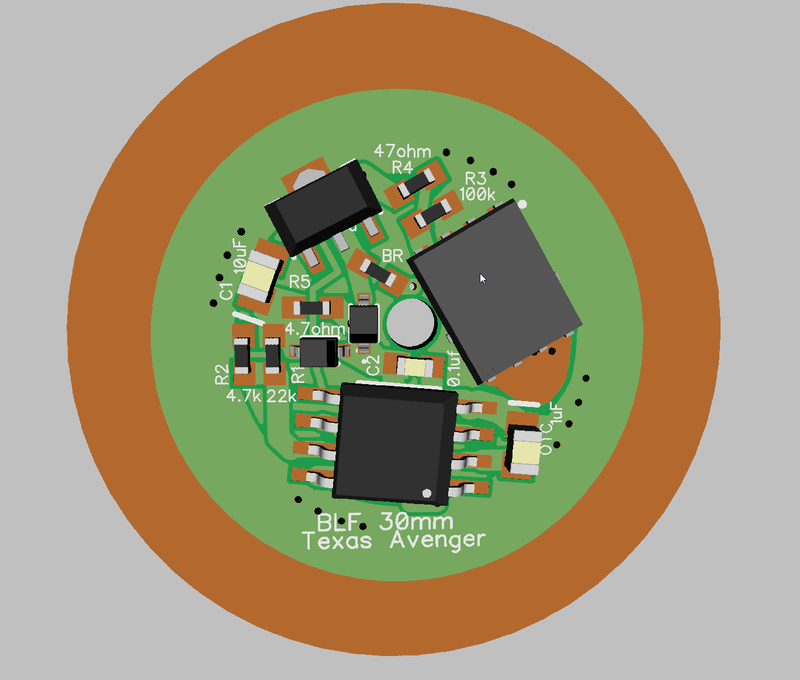 TA30 – 30mm series : Same as 22mm only larger silk screen basically. You can sand it down to anything between ~22mm and 30mm. But it costs a fair amount more as size goes up, which is why there are a lot of sizes in between. 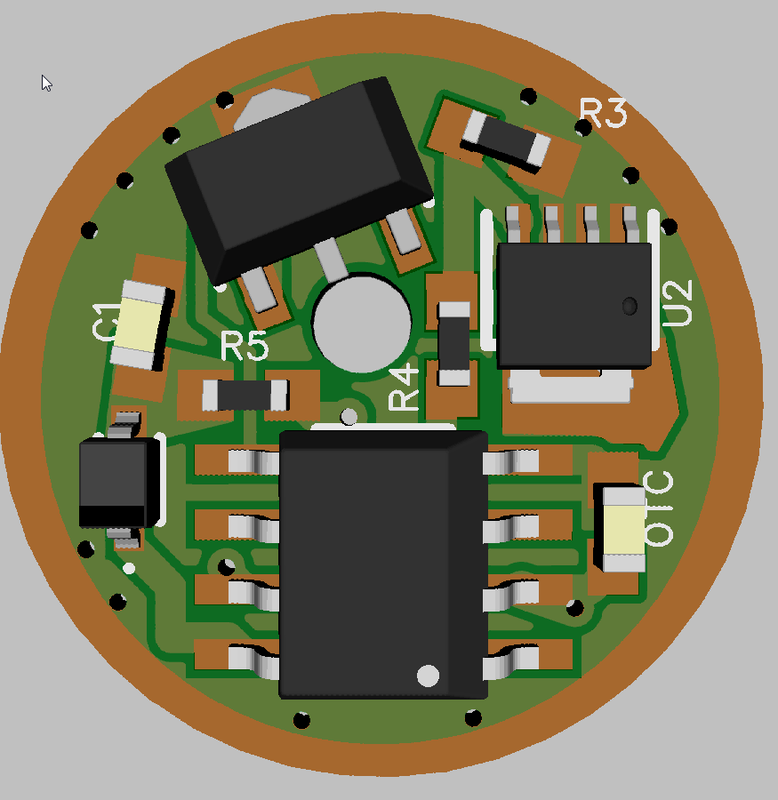 TADO1 – 38.5mm : This is a driver made specifically for the DO1 but might fit other flashlights as well. It is 38.5mm as you can tell. 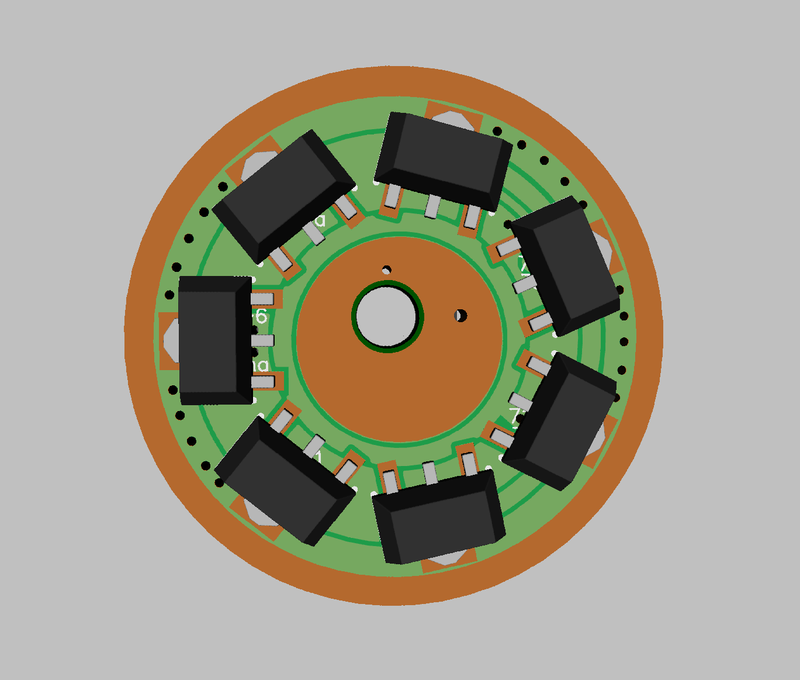 Same as all the other drivers except that all of the 7135’s have been moved to the top side of the driver and the contact ring on the bottom is sized to allow the batteries to make good contact. The OTC pads have also been upgraded to 1206 pad sizes since it is an e-switch light and this will make it easier to setup. Although you could use it as a clicky driver as well. 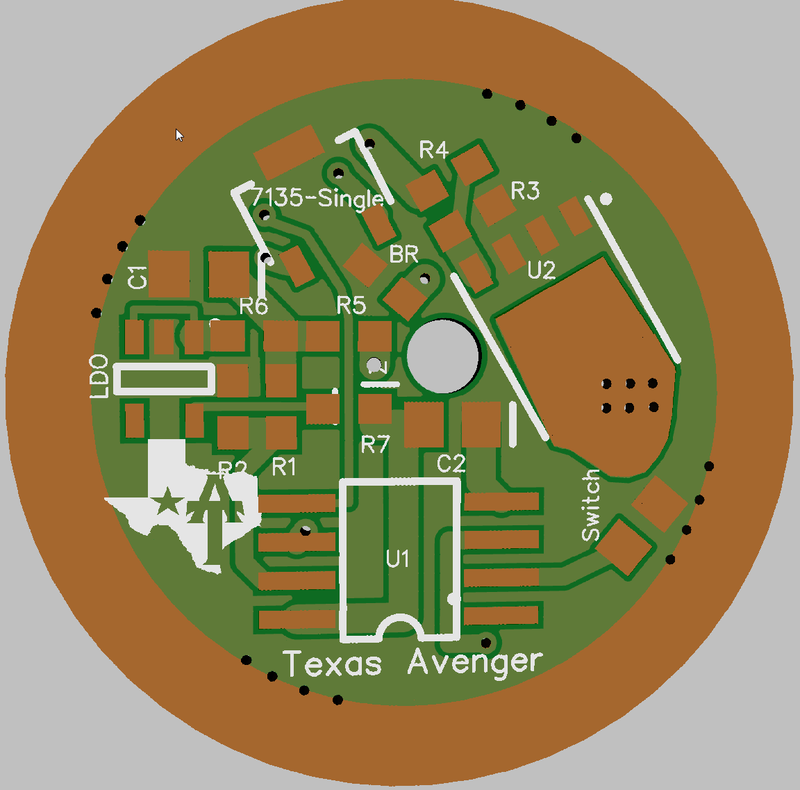 TA15 – 15mm version : Here is a super tiny version of the Texas Avenger driver series. 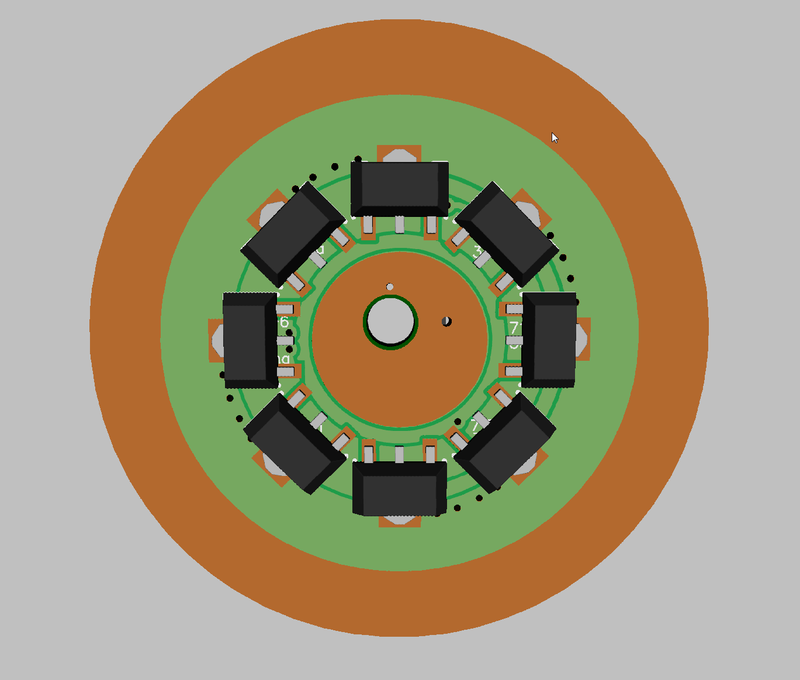 Due to the size it uses slightly differnt components then the larger ones. 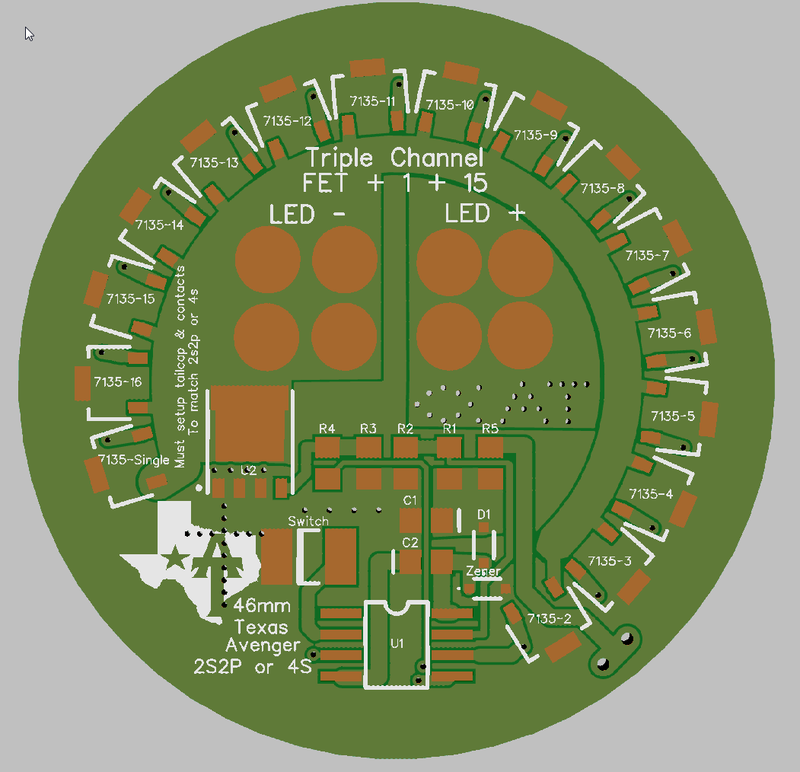 It is missing C2, R1 & R2 (It must use a firmware with internal LVP referance enabled) and the bleeder resister. The FET has also been changed to an LFPAK33 instead of the 56. 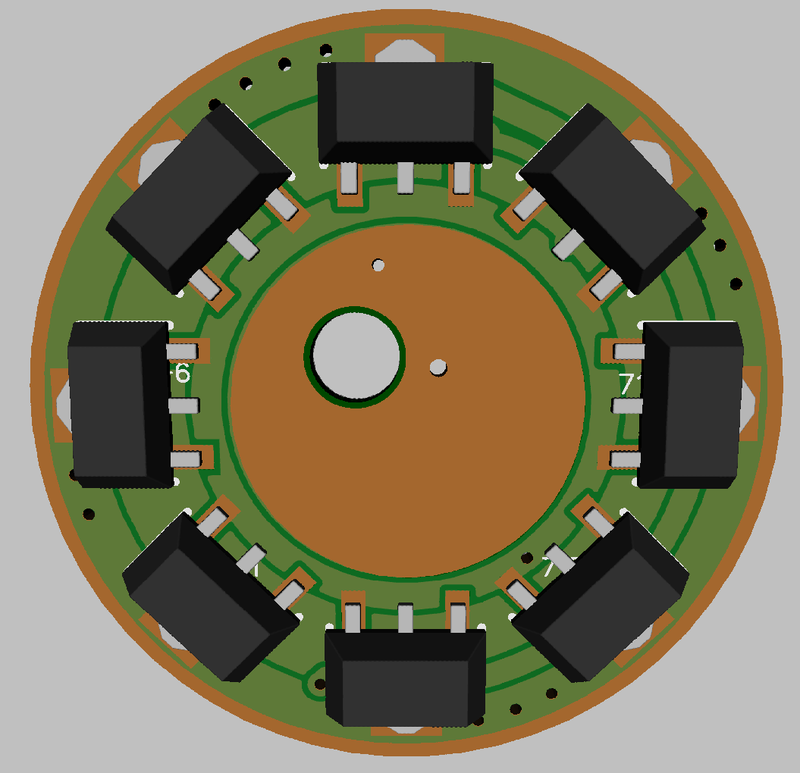 It also has 2 sets of OTC pads, this is because using the top side pads will prevent you from programming the MCU on board. The EX pads go to Pin 7 and are there for future expansion. Otherwise it is the same as the rest. There are 2 versions of this driver. The compact version has the components placed super compact to allow as much edge clearance as possible. You can sand it down to under 14mm. The downside to this is that it will not be able to be programmed without removing something from the driver. 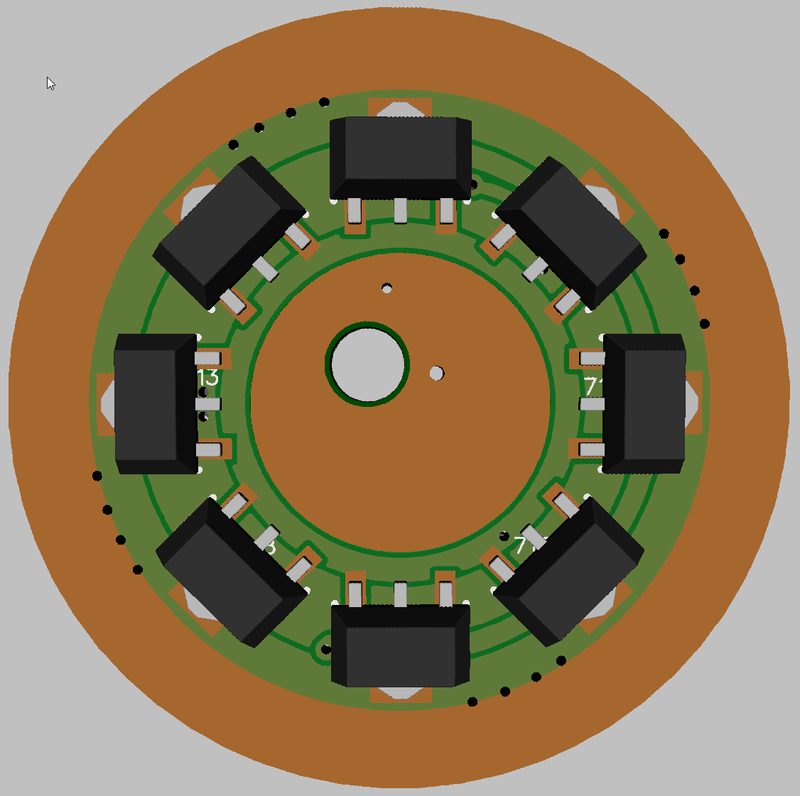 The normal version should allow even a Tiny85 (with pins bent to fit naturally) to be programmed on board but has much less edge clearance. 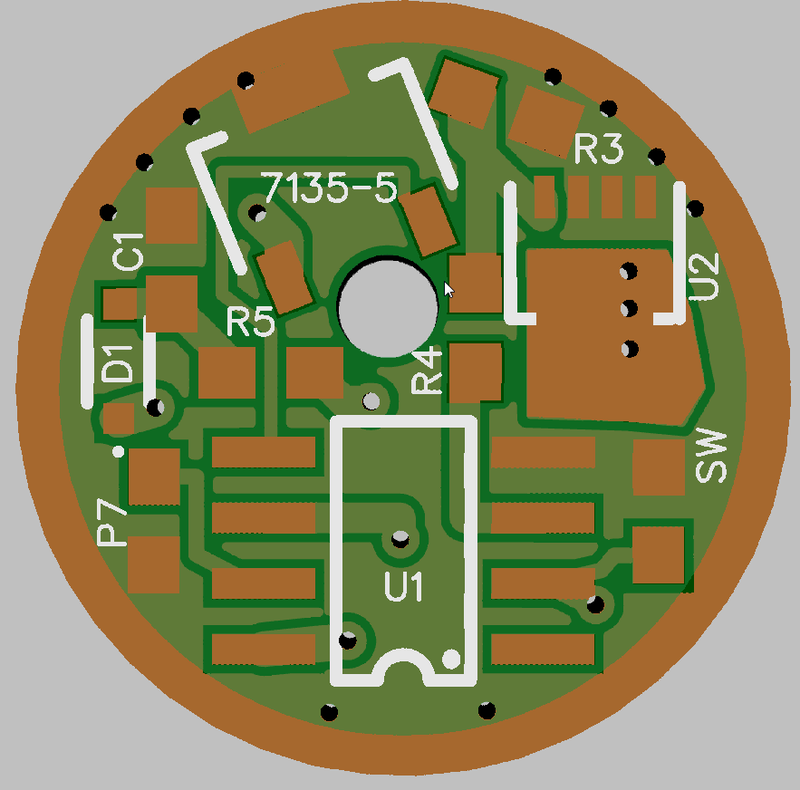 This driver was requested as an easy way to convert the ZY-T08 to 2S operation for conversion to an XHP or MT-G2 LED. The driver must be aligned with the cells with the body fully screwed on. Button top cells are required, solder blobbing the driver is not recommended, blob the cells instead. 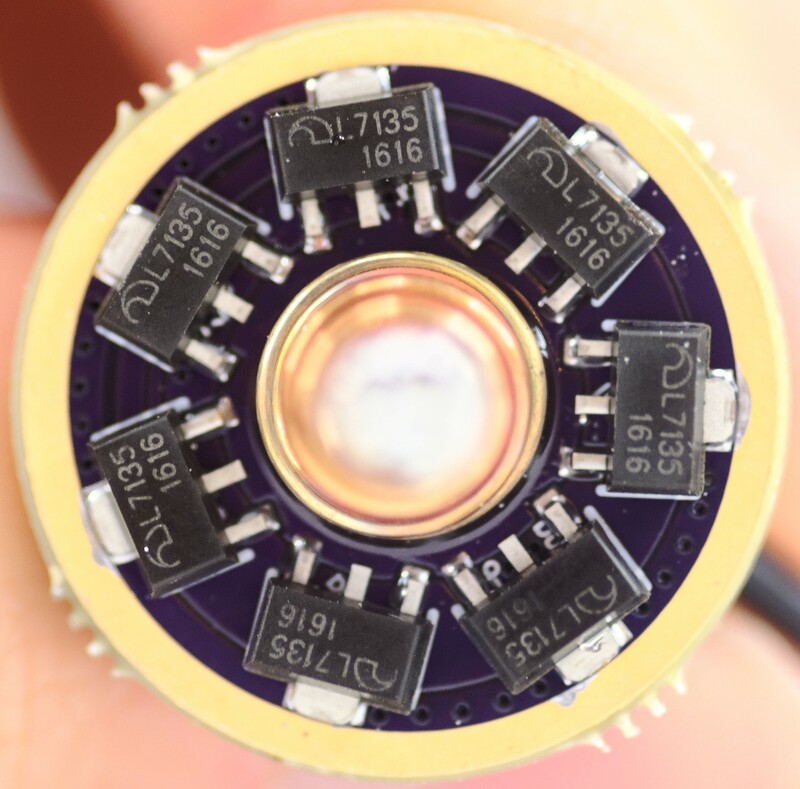 The tailcap PCB MUST be modified to remove all connection to the body of the flashlight by cutting the traces. A Dremel works great for this. 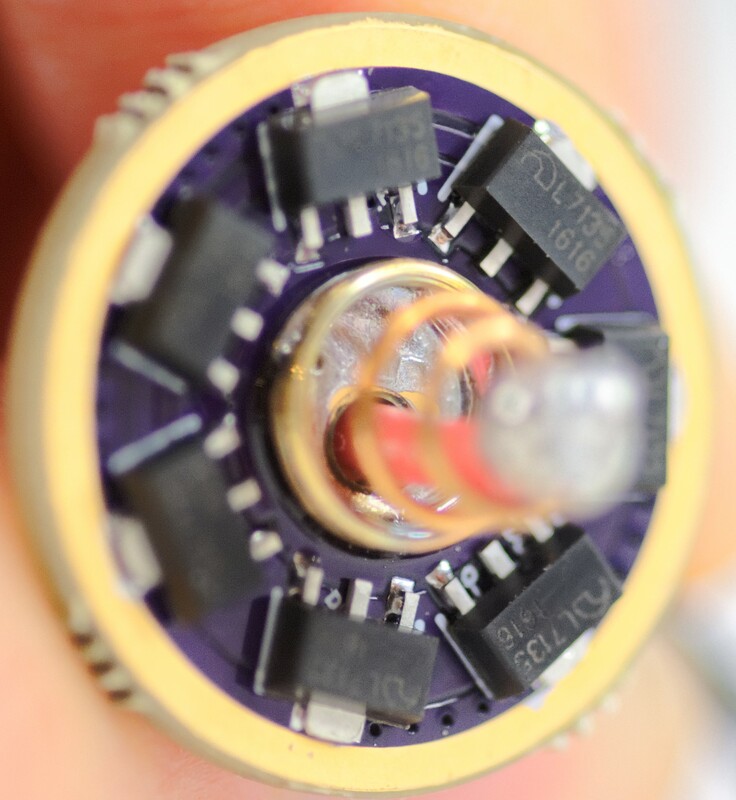 The zener must be installed or you will fry the driver. 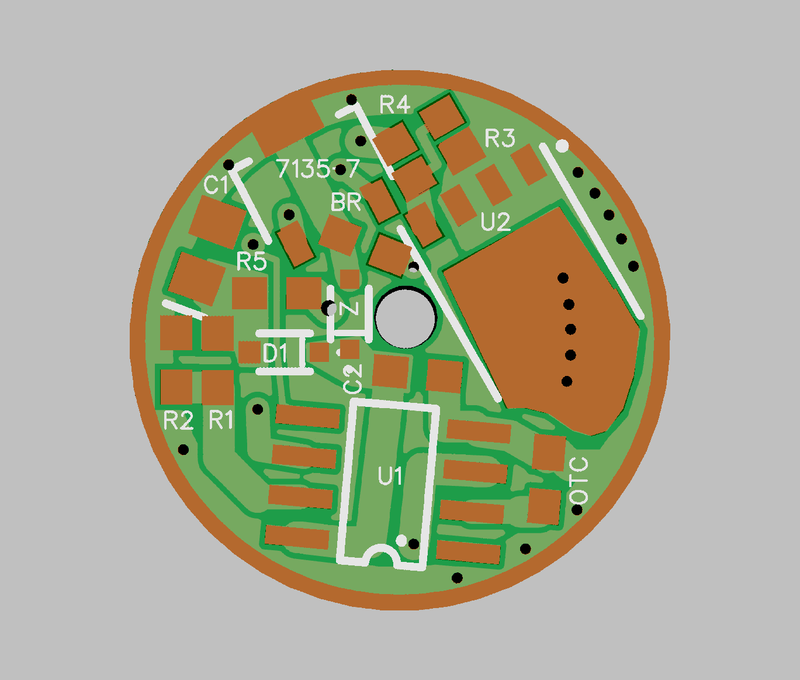 The R1 resistor will also need to be changed out to a 2S setup, 36K is popular. You will most likely need to recalibrate low voltage protection. 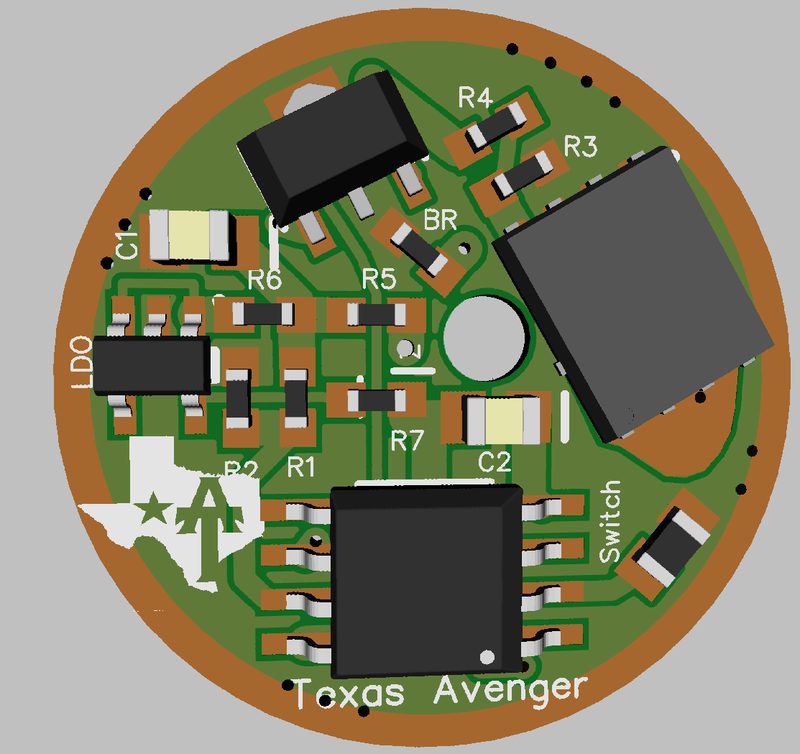 All the other parts are the same as a normal Texas Avenger. These LDO versions of the drivers are mostly for e-switch lights that will be used in 2s or more configuration. Zeners cause a lot of excess battery drain when the light is “off” with e-switch drivers. You can bypass the LDO by putting a normal SOD-323 diode across the futherest right LDO pins, with the line pointed towards the MCU. The added R6 and R7 resistors are either 0 ohm jumpers or R7 can have a small resistor installed to correct for a C2 cap with the wrong ESR. C2 also needs to be increased to 10uF, you can use the same one as you do on C1. C1 must also have a cap rated for the full voltage you will be using! 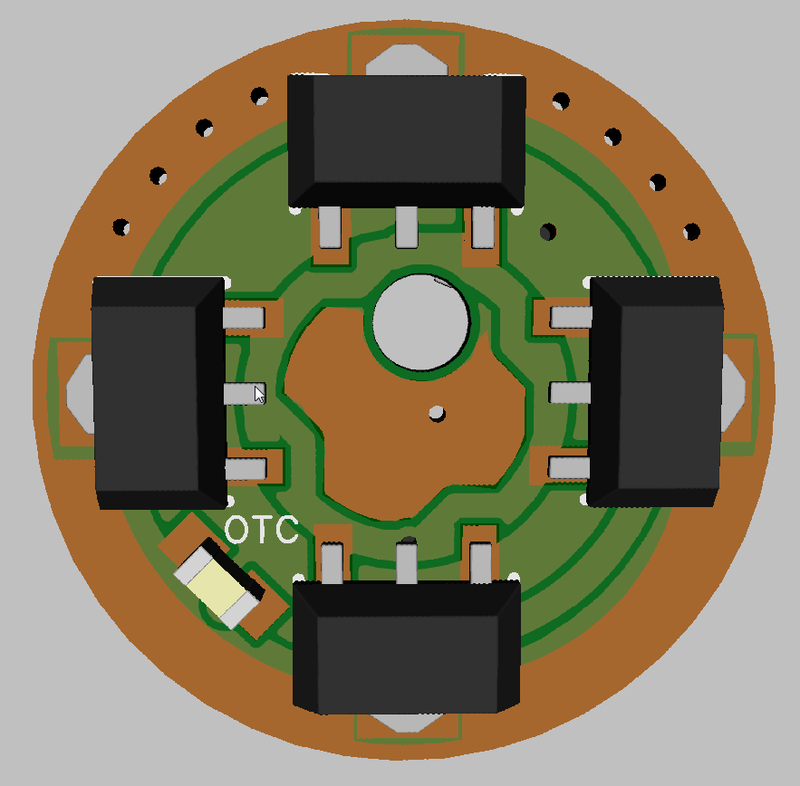 The OTC name has been changed to “switch” and upgraded to 0805 pads since most of these will be used for e-switch lights. An OTC can still be used though. 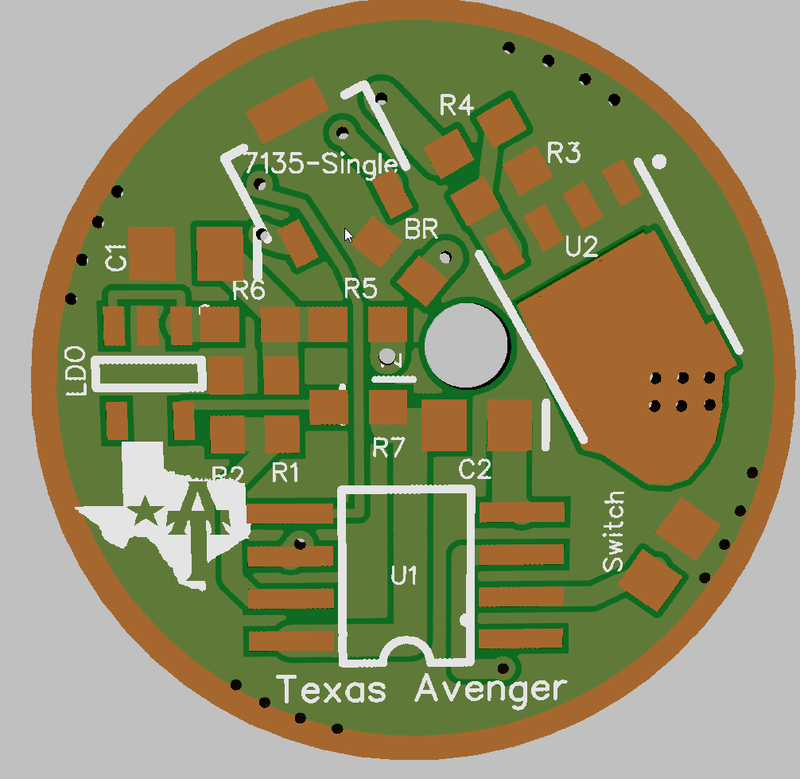 besides that they are exactly the same as the rest of the Texas Avengers drivers, just with less edge clearance for a given size due to the LDO. This is basically the same as the above LDO drivers except it uses a different LDO and doesn’t have the jumper resistors. 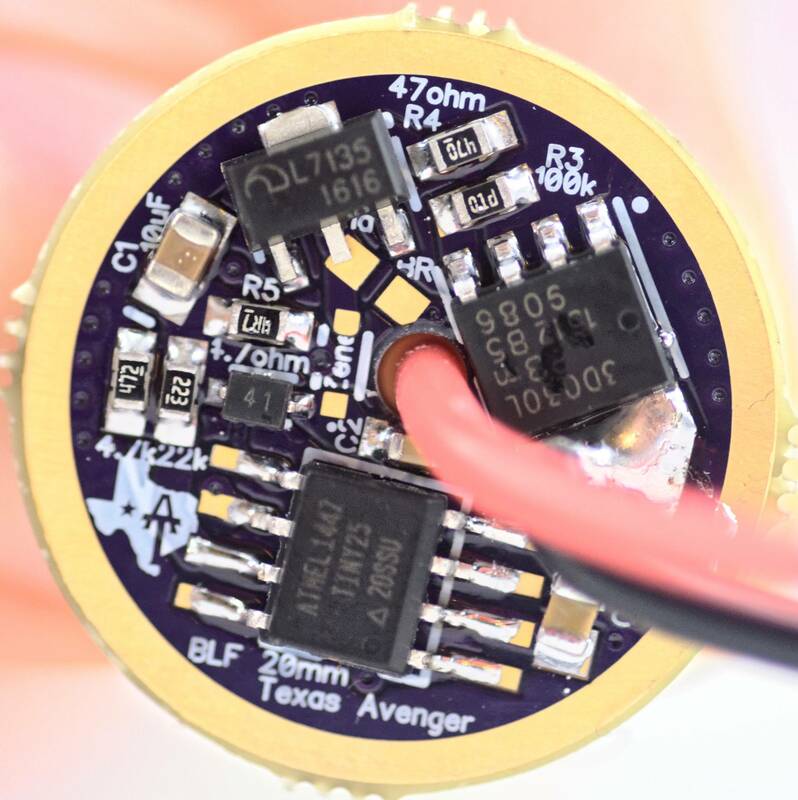 Highly recommended to use this driver in multi-cell lights over the zener version. 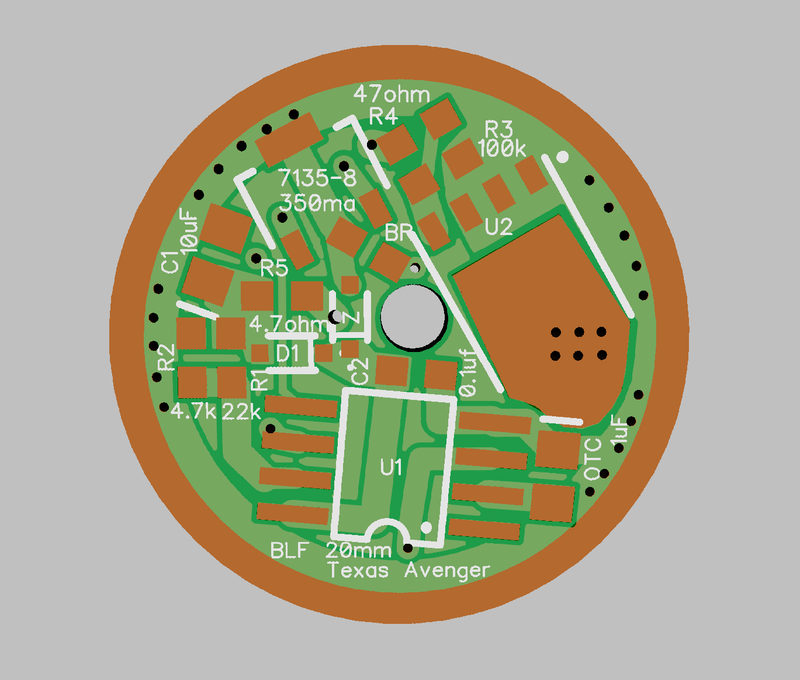 Ok, here is a 46mm Texas Avenger in SRK / Q8 Size. 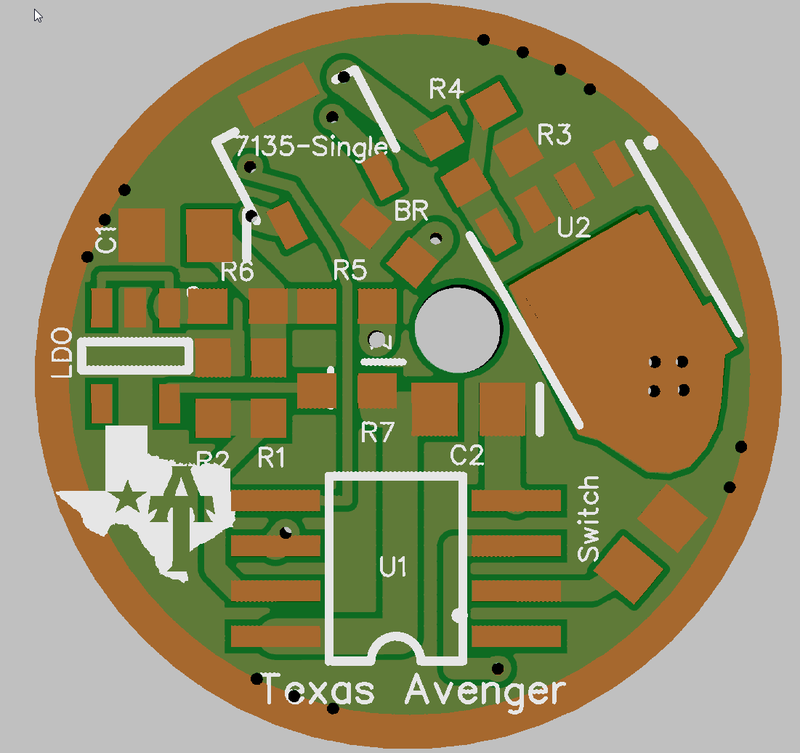 It is the same as a Q8 V5.1 driver except with the added bank of 7135’s and a slightly differnt pinout to match the rest of the Texas Avenger series. All the pads are 0805, except the OTC / E-switch whch is 1812. Full copper pour including nice heavy pour from the ground ring to under the MCU. This should help the internal tempreture sensor if it ends up being used. It also has a zener even though it is useless for an e-switch light, simply because I can. It has a total of 16 7135’s, 1 on the single channel and 15 on the bank. Total they are capable of regulated currents of 350mA – 6A depending on how many you install and if you use 350 or 380mA versions. That should net you around 1800-2000 lumens of regulated power depending on the LED’s. Naturally the FET is there as well and can handle up to 50A. This is the same as the above driver except it comes setup for 2S2P and 4S setups. 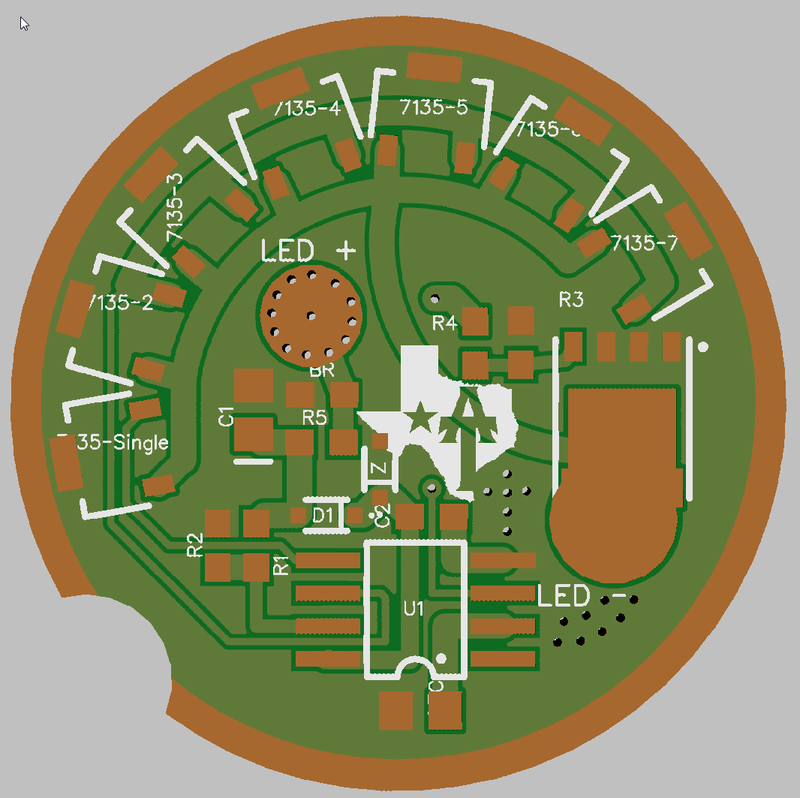 It is a classic SRK driver but setup for 2S/4S 6V/12V LED’s (or 2/4 LED’s in series). So this is what you want for an XHP35 (although for an XHP35,be warned, they generally die very quickly if an FET is used) / XHP50 conversion. 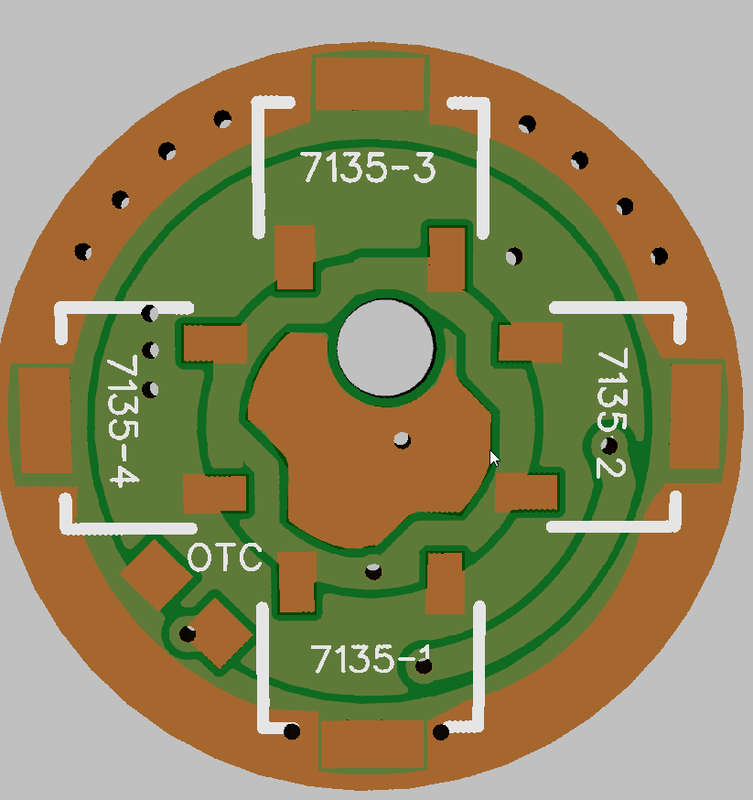 The ring on the outside bottom is connected to the 1st cell positive to give the MCU 4.2V. 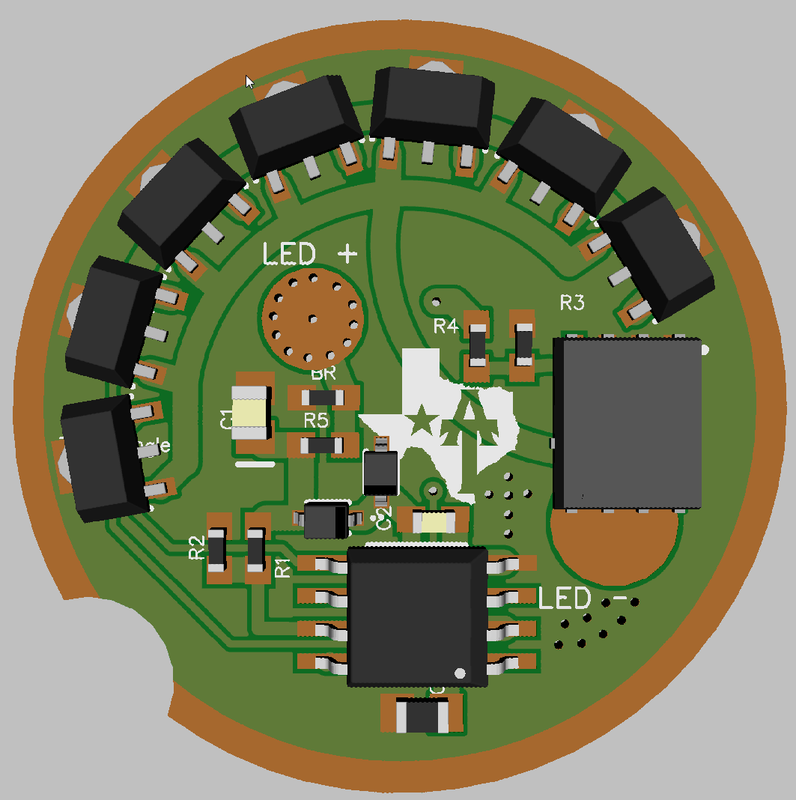 The LED gets the full 2s or 4s voltage, this allows you to use the driver without an LDO or zener. 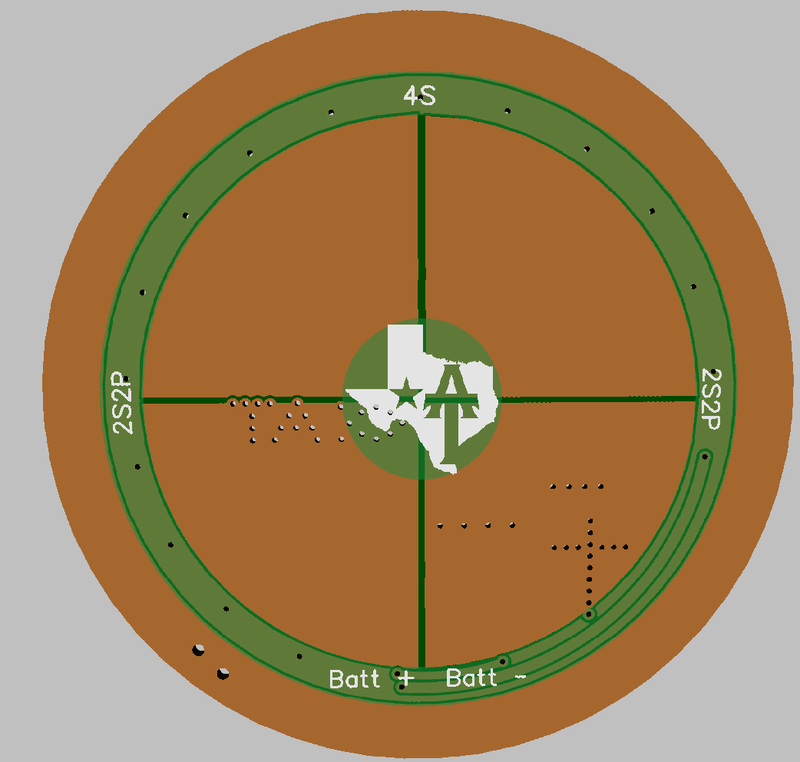 You will need to bridge the bottom side pads according to what setup you will be using 2s or 4s. I recommend just going 4s unless you need to do 2s for some reason. 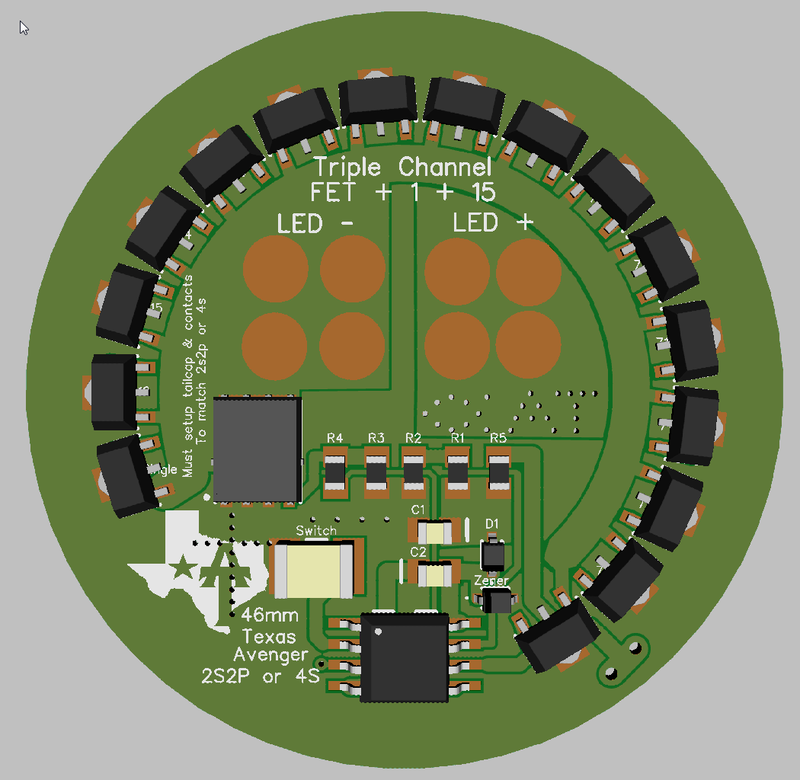 You can either just solder bridge across the pads or use 0 ohm 0805 resistors to bridge. Follow the silk screen on which pads to bridge. 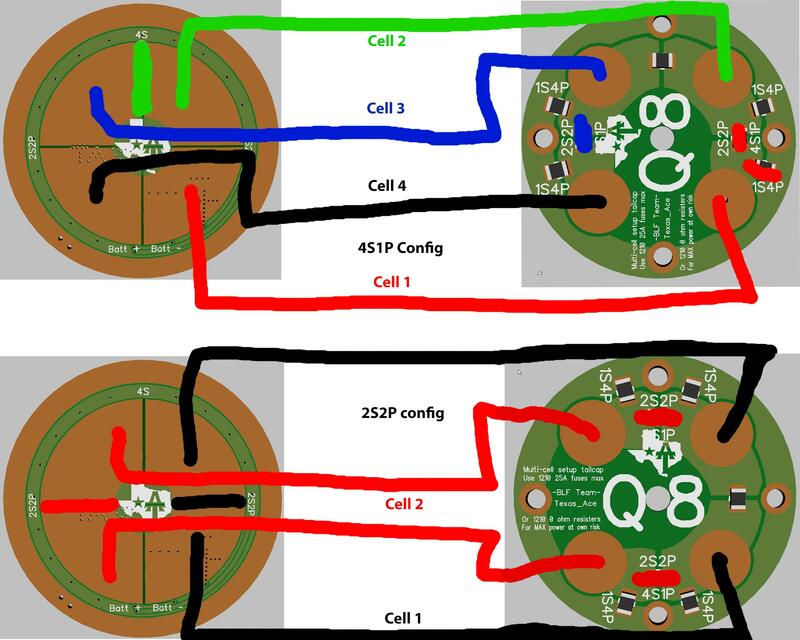 You will also need to modify the tailcap PCB/setup so that the cells will be in the desired 2s2p or 4s setup and so cells can be installed from the rear of the light. Don’t forget install springs on the driver pads to keep from damaging the driver when dropping the batteries in, plus you then don’t need button top cells. The 1st cell that conects to the ground pad on the driver needs to have it’s positive end connected to the flashlight body., then obiously match up the cells acording to what you are doing. Yes, this does require you think for yourself, this is an in depth mod, you need to understand what you are doing. Otherwise it is the same as the rest of the drivers. It does not have a Bleeder resistor and the zener is useless. This driver is exactly the same as the TA46-S. The only differnce is that it is setup around an LDO (voltage regulator for MCU), instead of splitting the cells postive. Good for custom setups. For this driver all the voltage passed through the pads on the bottom of the driver, the ring on the outside of the driver is stricky for heat sinking the 7135’s. Make sure that the flashlight body is insolated from both ground and voltage with this one. R7 : 1206 0 ohm resistor or low ohm resistor if the C2 cap used is not the correct ESR. 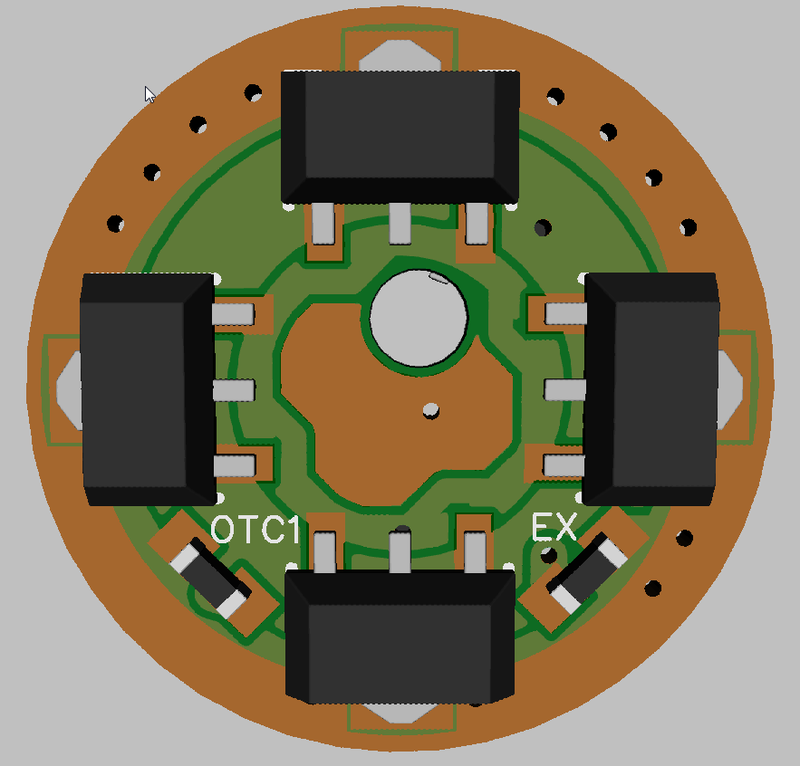 C2 : Use a 10uF cap here instead of the normal 0.1uF, the LDO needs the larger cap. R1 and R2 will have to be adjusted as well to match the higher voltage and you can not use the internal voltage referance for LVP. This driver is basically the same as the one above except it has a single contact pad. This means that you will need to use a cell carrier to get the input voltage setup for 2s or 4s. It can accept and work with 1s, 2s, 3s, or 4s input voltages as long as the output LED setup matches the input (aka, 6v LED for 2S cells ect). It is exactly the same layout and driver as the one above except for the contact on the bottom. Very crude diagram of how it is wired up, the colors are simply to denote the seprate cells and have nothing to do with polarity. Q8 / SRK Multi-cell setup Tailcap, I am putting this hear since it is not worth it’s own thread. The Silk screen should be pretty clear. The spring pads are 10mm. This is the tailcap for the Q8. It is also setup to fit SkyRay kings. 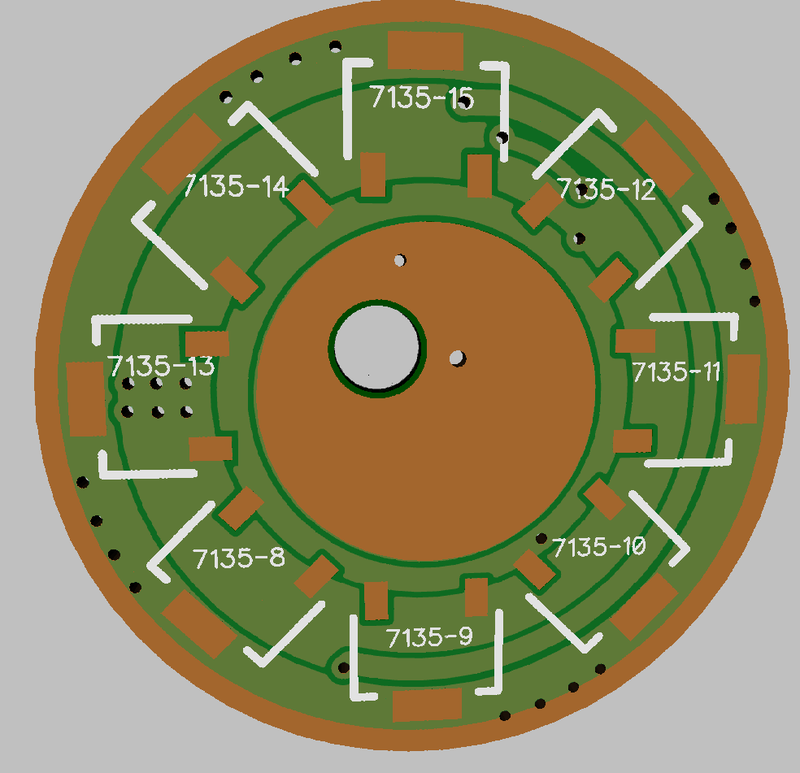 This is a universal tailcap PCB that allows for any cell setup you can think of from 1s4p, 2s2p, 4s1p. 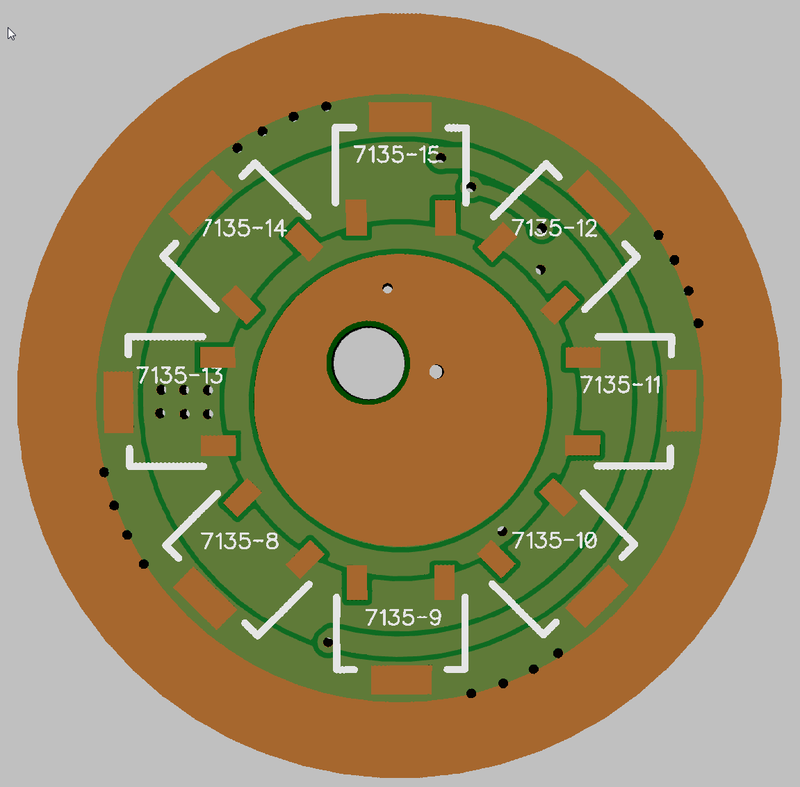 It uses 1210 fuses or 0 ohm jumper resistors to select the cell configuration. It also has a place for a clicky switch, although it would not work when using it in 2s or 4s mode due to needing the pivot point for the tailcap. 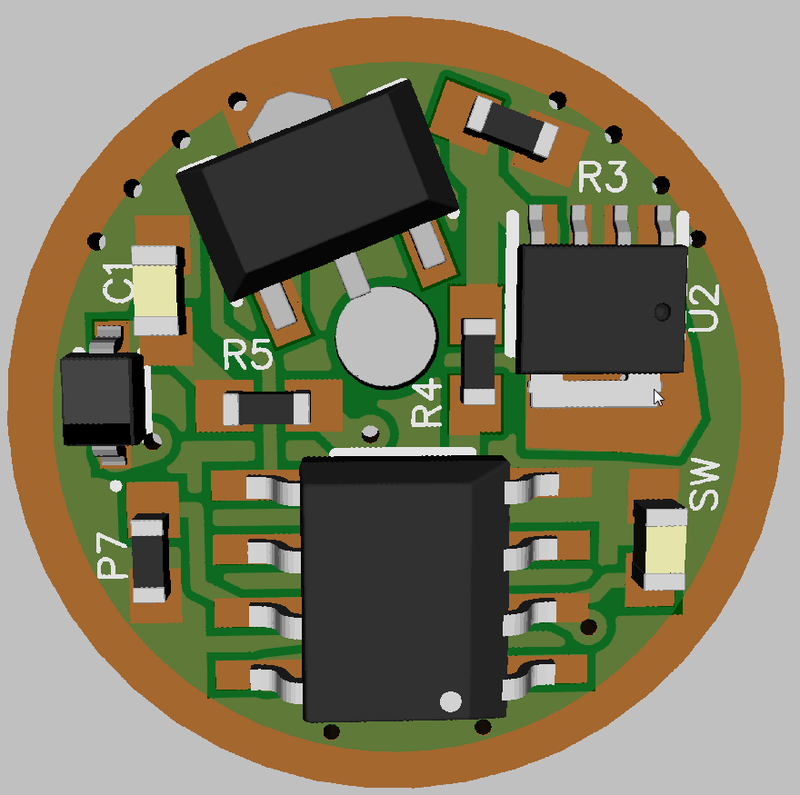 1s4p = 4.2v : how it will come from the factory, only one side of the driver needs to have the components installed but both would be great. 4s1p = 16.8v : for XHP35 conversion or running 4x XM-l or XP-L in series with separate stars. That is it for now, If anyone has any comments please feel free to speak up! Also if anyone wants a custom size of this I can toss them together and post them here. I would like to have this in every size that is known for flashlights use. Or you can just sand one down to fit as well. Cool! Impressive you got all of that to fit! 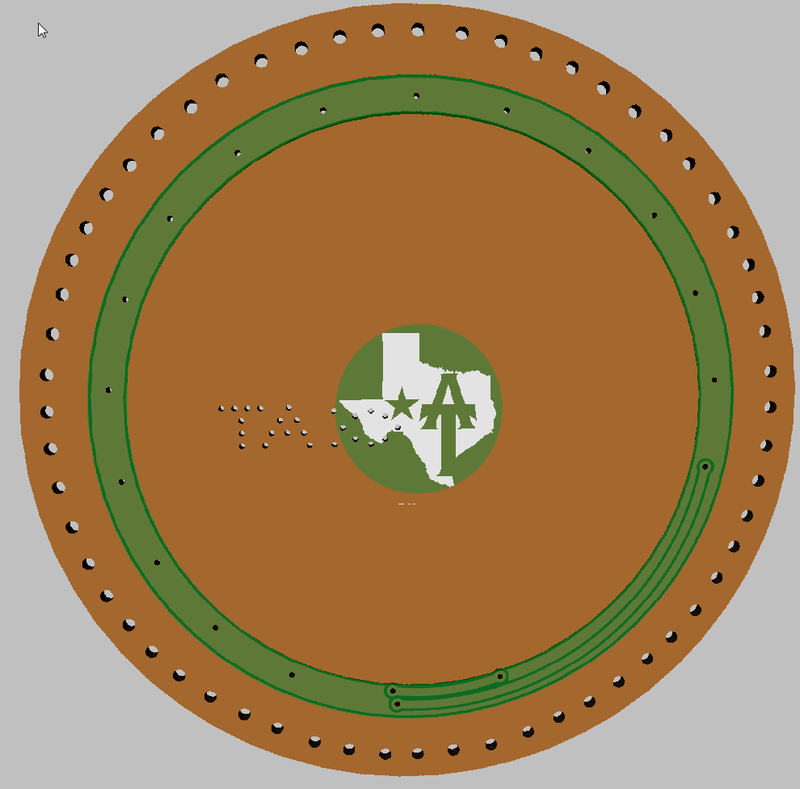 I do have a question though… These renders don’t flip/skew anything do they? I’m concerned about your 7135’s.. The pins look flipped to me? Nice! No time right now to review thoroughly, but seems like it's all there. You know what, you are 100% correct. 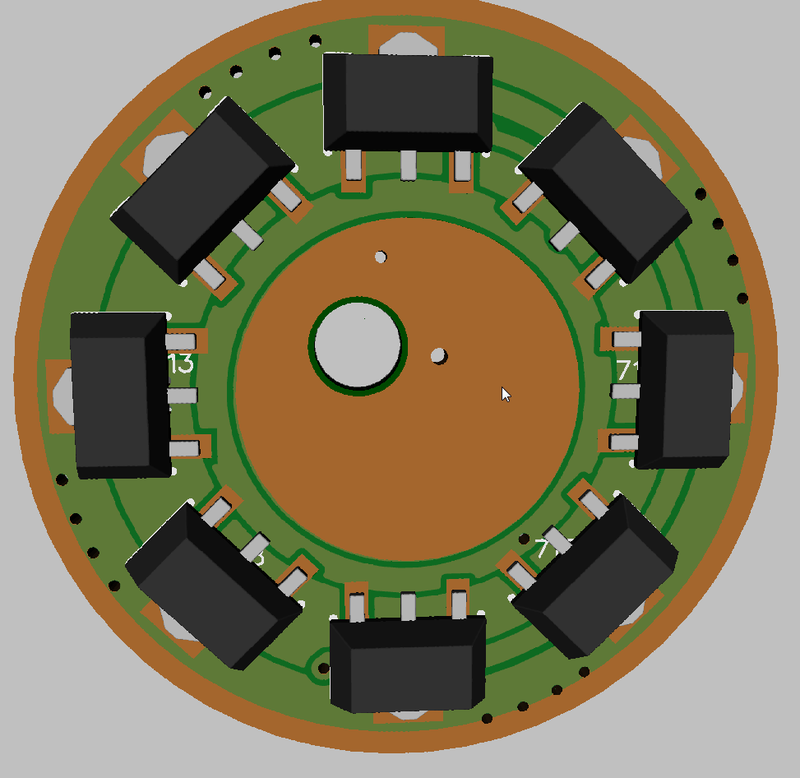 I must have got the pins mixed up in the schematic, since I made one then just copied it they all would have the same issue. Luckily it is a simple fix, just correct the schematic and it will fix all the ones on the back automatically. The front one I will need to rework, could be a bit interesting getting over that ground trace. I will look into it on Wednesday. Please do point out anything else I should rework while in there! Edit: Took a quick look and I think I figured out a way to flip the pins on the top 7135 without too much trouble. Can’t wait feedback after forum members build then. I dont understand any of it but can appreciate the work you have put into it. Nice. Ok, found a little time this morning to knock out that fix. Ended up having to go with anther via to jump the trace, trying to keep it on the same side of the board was just proving to be too much of a hassle. If anyone else spots a mistake I would love to find out about it before ordering them lol. Have you and TK somehow figured out PWM on pin3 for the Attiny13, or is that for the 25? It is for the Tiny25, I personally see no reason to use the 13A anymore unless you just happen to have them on hand, in which case they would be perfect for gift lights IMHO. The tiny25 offers twice the space and options. It is a direct swap for the 13A as well. For the extra $0.10 cents is well worth what you gain for me. Plus not like there is a learning curve or anything like that to using them, if you use TK’s flash scripts it will automatically sort out all the fuse settings for each chip. You simply order a different part and flash tiny25 firmware. The bistro triple channel firmware is posted in TK’s firmware thread, I will copy it here once I test it out with these drivers. 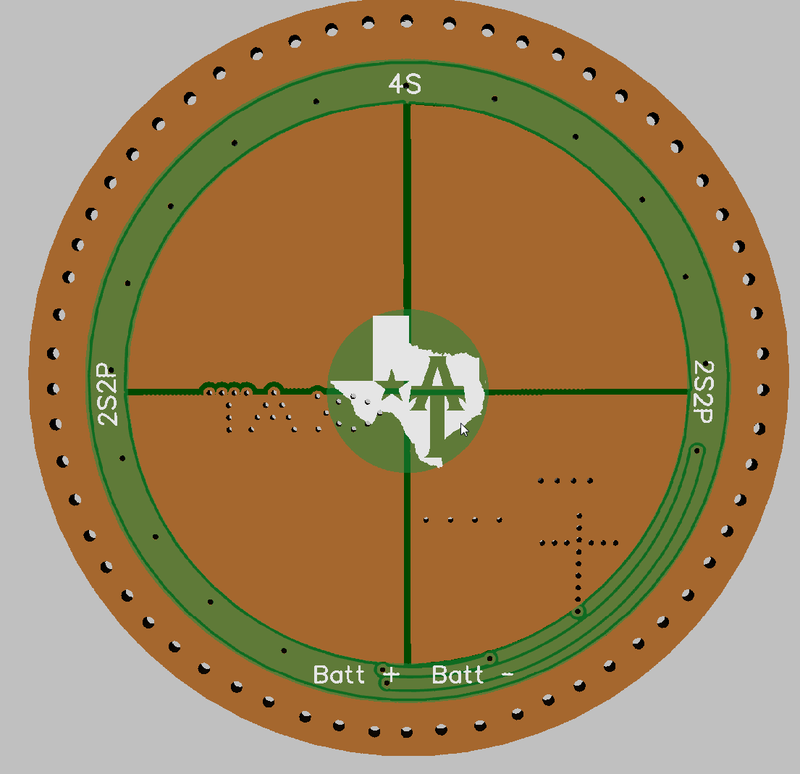 These can also use a Tiny85 on the 20mm and larger boards (the 17mm can as well if you bend the pins). And that is still an option for those that want to use up some old 13A’s, it should work just fine with the A6 converted firmware you have been using as well. If buying new parts though I would highly recommend spending the extra dime and getting the tiny25 though, Nice to have the option to upgrade later if something new comes out. LOL, I actually have no idea how many I have at the moment, I know it is at least 60. If you add in all the small 9 led style lights it is a fair amount more but I don’t really count those generally. ….If it ain’t broke ….Fix -it ..
Well, it depends on what you consider a real light. For me, it would have to be probably at least twice that many. If you want ~1000lm OTF, you’d need at least three times (36 lights). There are 1 or 2 little things that I have learned that you may or may not find helpful, but it require a bit more work on your part and I don’t want to start nit-picking against your desire. They aren’t necessary for proper function. LOL, well I am not going to rip apart all my old lights to put these drivers in them, just the ones I use the most. These are mostly for the new lights I build, this way I can have a standard driver to build lights with. Do feel free to point out anything you have noticed. Got to learn someplace. Never worked with boards this small before so there are a lot of learning curves to experience. Have you uploaded to Osh/your fab to see how they render it yet? Especially with text on the silks, Osh tends to shift them around for some reason and they get all messed up. 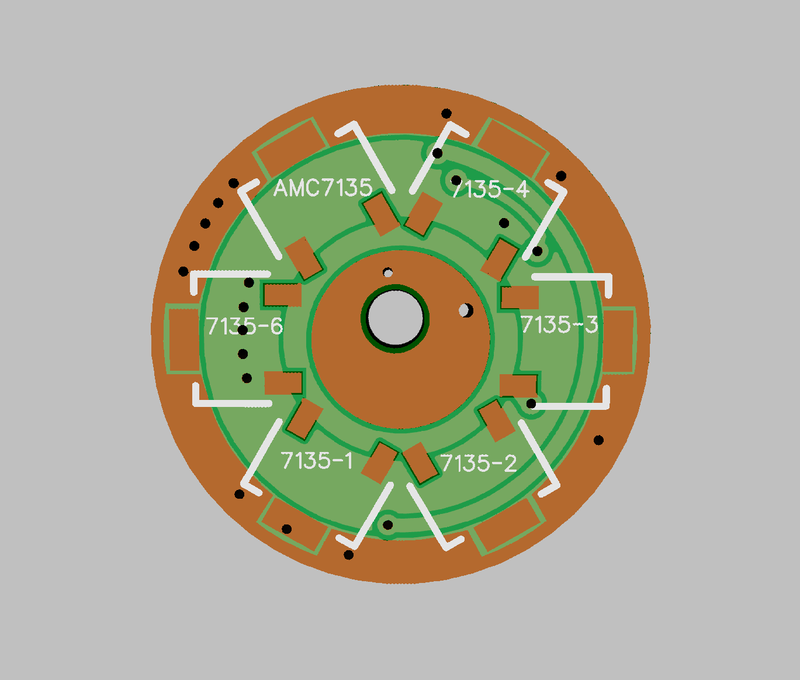 Also, I learned personally and through Mattaus’ Eagle tutorials, a lot of footprints you find for the AMC7135 (whatever package it is) aren’t completely correct and cause a bad fit when building. You may want to double check the pad sizes/locations. 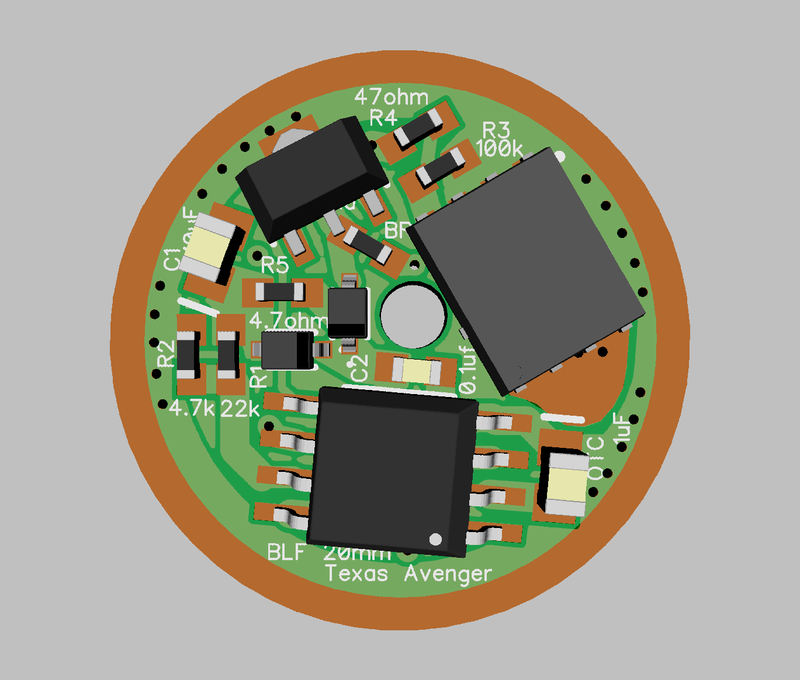 I did indeed try uploading it to OSHpark, far as I can tell there is no change from the design spit out by Diptrace. I just checked it again and I could not see any differences in either the traces or silk screen, except the logo looks a bit lower resolution on oshpark but that is to be expected. I just checked the pad sizes and spacing again with a 7135 I have here. Everything lines up perfectly with a bit of overhang on all sides according to my calipers. Maybe it is just an issue with eagle? I don’t think it is an Eagle thing necessarily, just the source of where the footprint came from. You just must of had a good footprint to start with. diptrace sounds pretty cool though! Really nice work TA. Love the organic layout. I haven’t been keeping up on driver ciruits. So I may have missed recent developments. I’m curious about the voltage divider being fed by R5. Doesn’t that make the cumulative resistance of 9.4 26.7 22,004.7 ohms after passing R2 R1? Power to the MCU also goes through R5 (and then the polarity protection diode). What is the purpose for R5? I’m certain you have it there for good reason. I’m probably not aware of issues that it must remedy. EDIT2: Fixed another error. Brain fart. Not really a difference from 22K. Can you explain that a little bit more? Why would you use 220k and 47k for e-switch lights? Very possible, I just picked a random component with the footprint, guess I got lucky. Really nice work TA. Love the organic layout. I haven’t been keeping up on driver ciruits. So I may have missed recent developments. I’m curious about the voltage divider being fed by R5. Doesn’t that make the cumulative resistance of 9.4 26.7 ohms after passing R2 R1? Thanks, it was a learning experience but a fun one that I think turned out pretty good. Far as the questions about the circut, like I said in the OP, it is not mine, it is blatantly stolen from DEL and all the people before him. He would be the one to ask about all of that. Basically these changes came about when DEL was scoping out the new Q8 driver, he determined that these changed provided a much more stable and reliable driver overall as it was getting some nasty voltage spikes with the classic circuit. This is actually something that TomE has been doing, it drastically reduces the parasitic drain when the light is off by a factor of 10x. Thanks. That helped. You summed it up nicely. I’m a total ditz. I just realized the cummulative resistance would be 22,004.7 ohms. Not really a difference from 22K ohms. 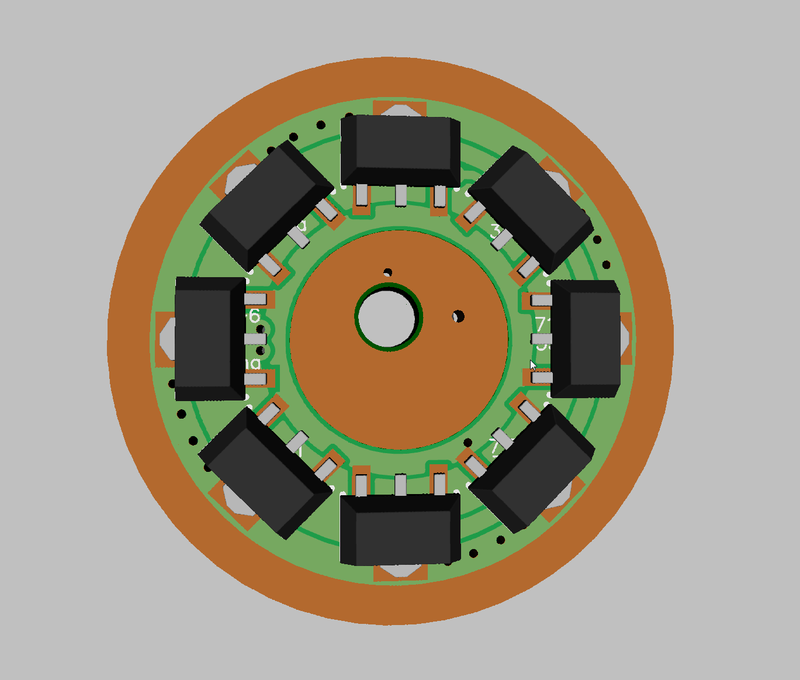 The Q8 driver ‘stock’ BOM already had some refinements added to the basic DDm driver circuit (R4 and C2). But R5 made all the difference. Honestly I intended to do this long time ago. Just never took the time. 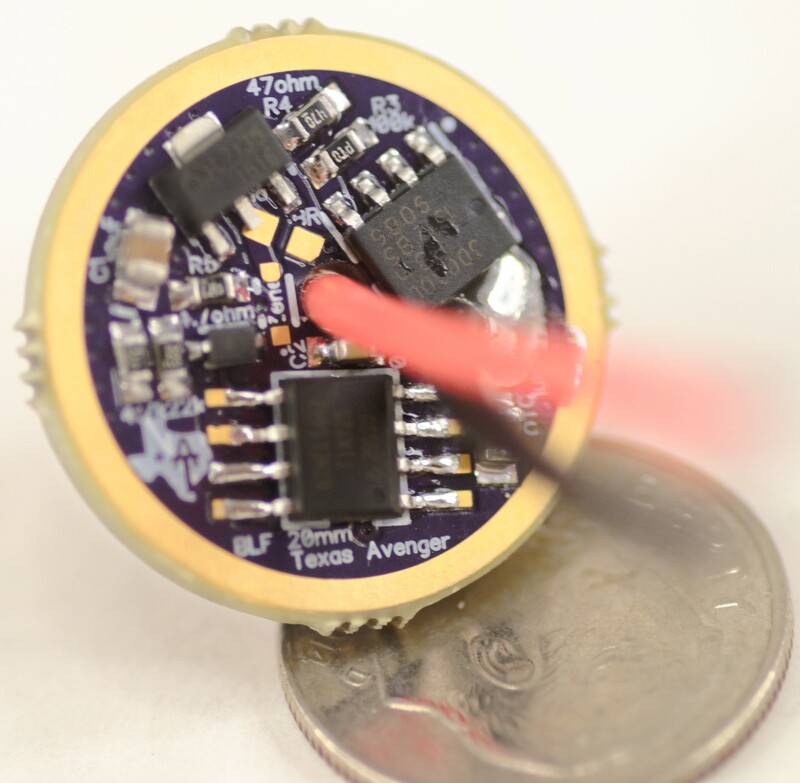 It is also not obvious setting up something that electrically looks like a high-power flashlight, but is simple to probe, power (with cells, not a power supply) and monitor.